“Hit or Miss” 43-48950 visually hasn’t change all the much but the devil is in the details. That’s what much of the work has centered upon, the biggest is the addition of the Observation Dome. It’s through this dome the navigator would “shoot” the stars and keep the flight on course. #43-48950 had its dome removed a long time ago and finding an original to replace the piece of plexiglass that was in its place one heck of a task! Ed had managed to find a replacement dome a year or so ago. But what was missing was the all-important mounting fixture for the dome. Since it was not the most important task, the hope was that time would fix the situation. 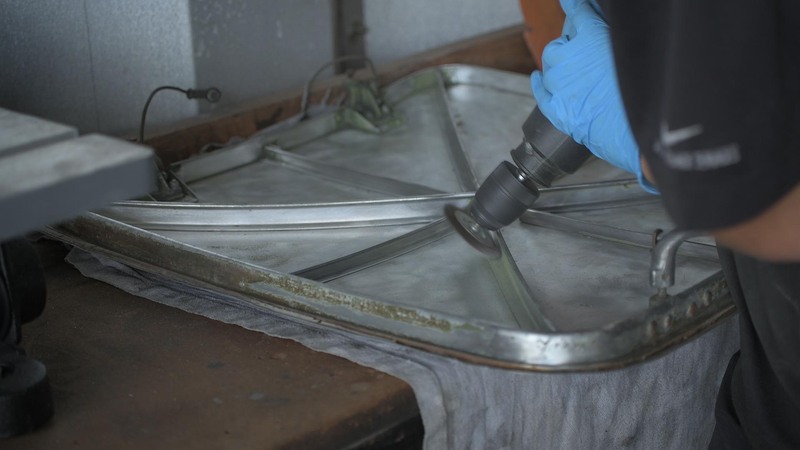 Manufacturing a new mounting fixture for the dome would be a time consuming process. 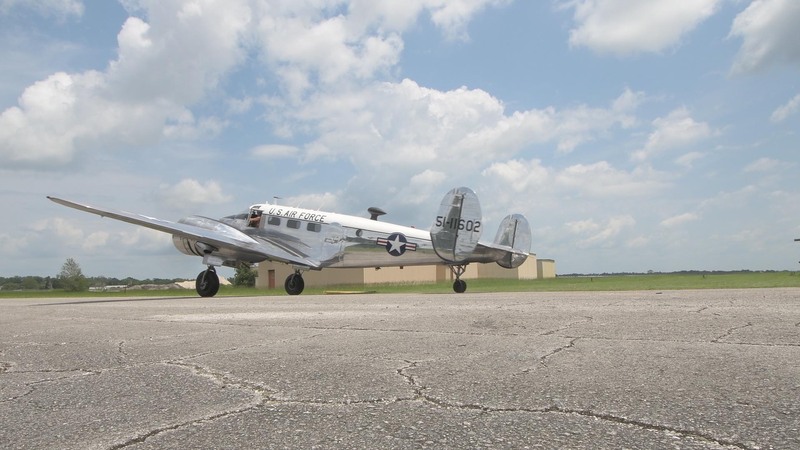 And as life would have it in restoring a WWII aircraft, just before it was time to start manufacturing the fixture an original became available. Phew! 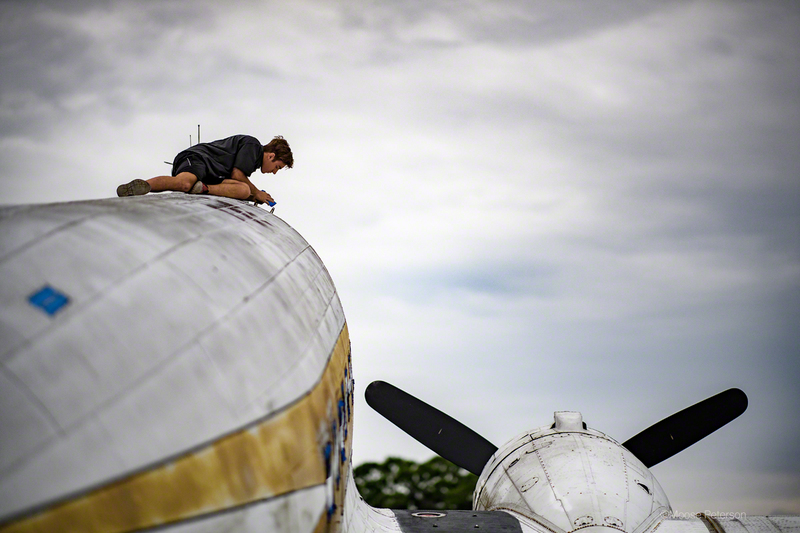 It was not in “new” condition, so the first task was for Ed to buff out the dome which cleaned up to almost new. This saved a lot of time of breaking the fixture apart to attach the replacement dome Ed had found some time back. Next, Davide took on the task of bringing the fixture up to standards to be used. This required a lot of TLC looking at every rivet, seam and ledge for corrosion or other defect. While that was in process, the actual hole in “Hit or Miss” where the dome was to be attached had to be prepped. Frankie, being the tallest, was elected to start that extensive process. The removal of the old piece of plex was easy, but a chunk of corrosion was found requiring a patch. Ed insists that all repairs are not only done to modern requirements but also period correct. Poor Frankie, the making of the patch was an all-day chore but when it was done, it was perfect! With the hole prepped then came the very time-consuming process of all the dry fitting of the Observation Dome. 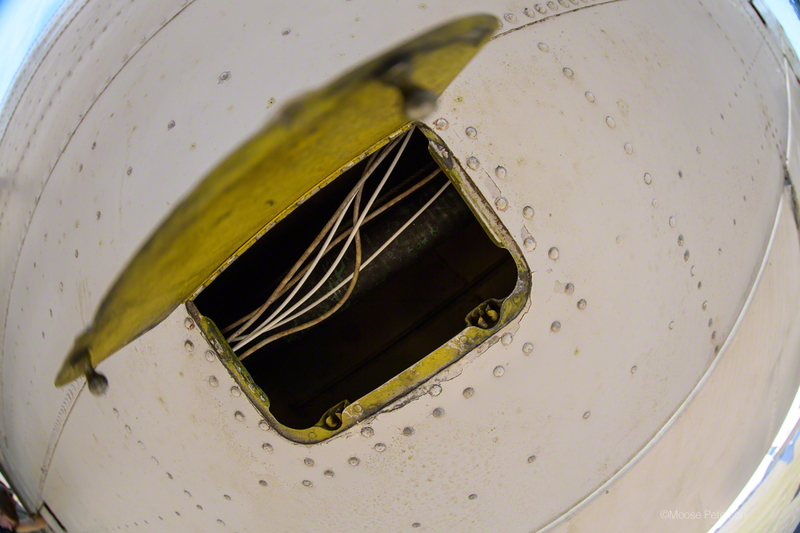 Not only did it have to be centered on the airframe, but the dome fixture is tapered to fit the curvature of the fuselage. Then there was comparing the rivet holes already in “Hit or Miss” to the holes in the fixture to see how many can be reused and how many new ones would have to be made. This is not a fast process; it required hours and took the project into the night. Finally, under our lights, success! The next morning would be “Hit or Miss’” moment in the lights for her formal portrait. One last visual detail to be finished was the port side landing light. Samy spent hours R&Ring the fixture, the gasket and the glass, but finally by midnight we were able to tug “Hit or Miss” into position for the next morning. 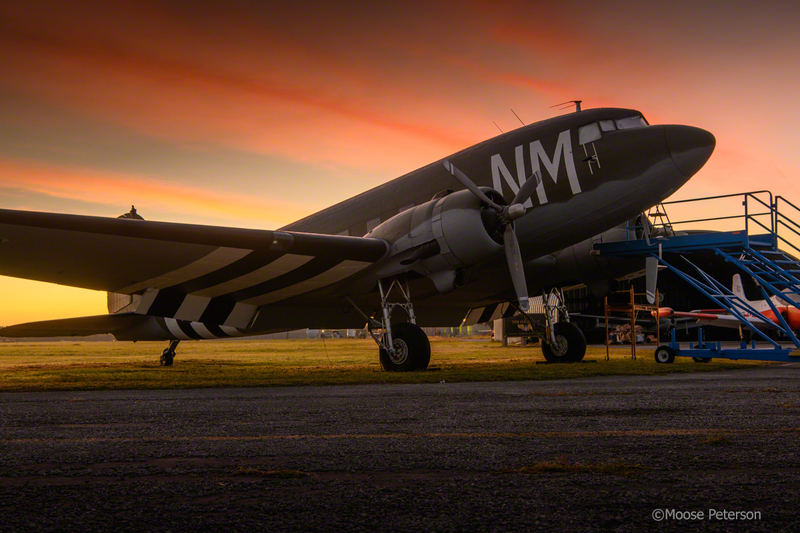 “Hit or Miss” spent a lot of time at the aerodrome Spanhoe in the UK. What you see here is how she would have appeared on many mornings there waiting to carry English and American paratroopers and supplies. It’s for them and all vets we are honored to bring her back to her glory! Work on “Hit or Miss” is now in small, incremental, yet very important stages. 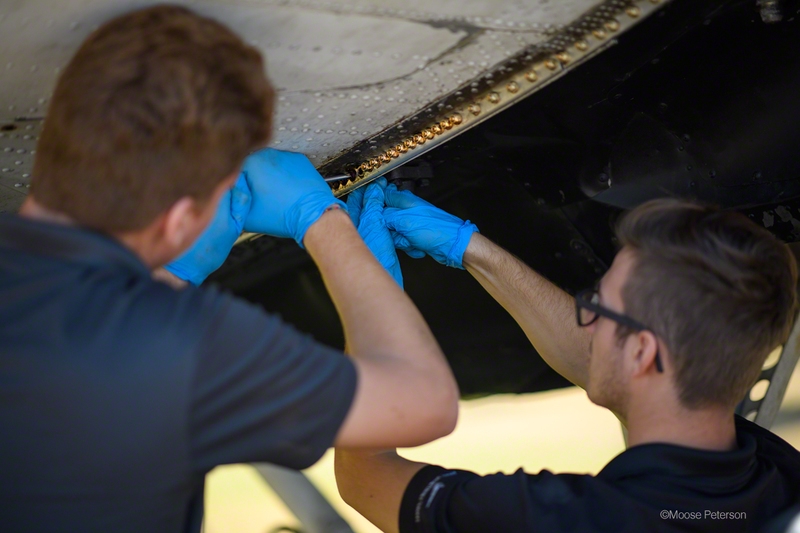 The folks at Turin Aviation have turned their attention to all the little details required to get #43-48950 ready but show little visual in progress in the last month. That all changed on this visit as all-nighters were pulled to bring together lots of little details with a couple of real big ones. 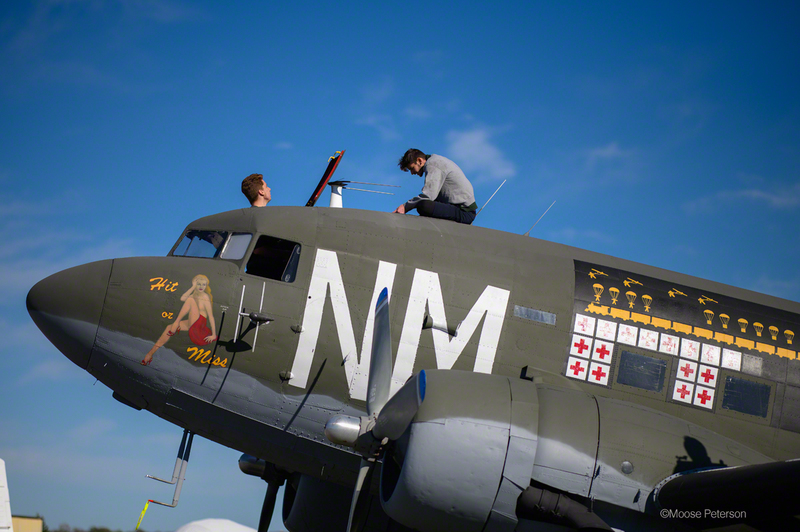 A tradition of many WWII aircraft was to have nose art, giving the plane individuality reflecting the pilot. 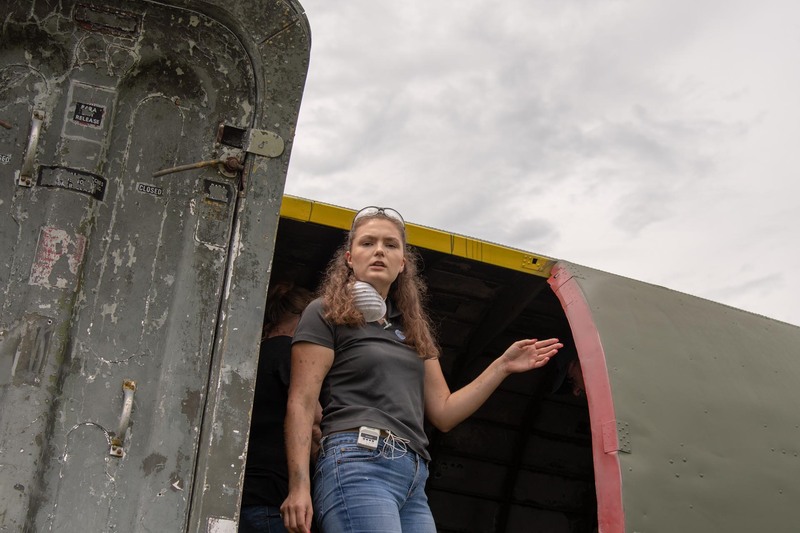 #43-48950 as far as research can determine never had any nose art. It was the lead plane in Operation Varsity and in its serial. 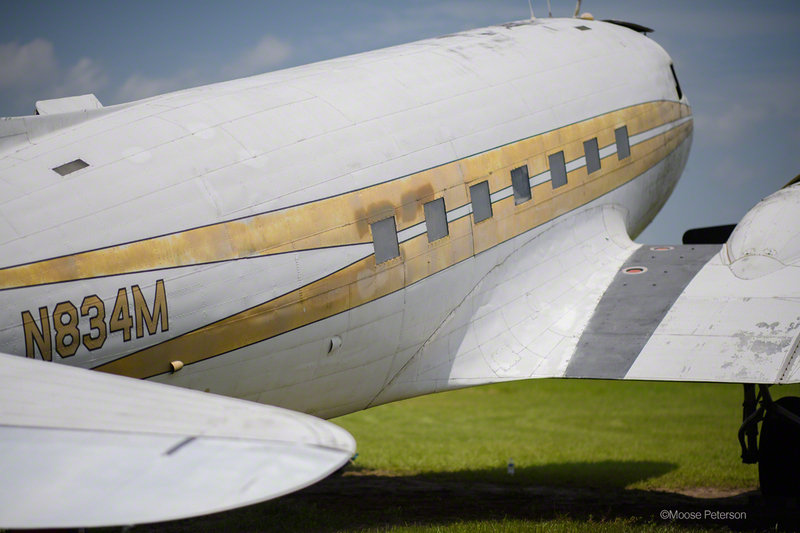 The majority the C-47s in the serial were filled with holes from the flax. #43-48950 somehow came out of the operation with scratch. For that reason, it’s been given the name “Hit or Miss”. 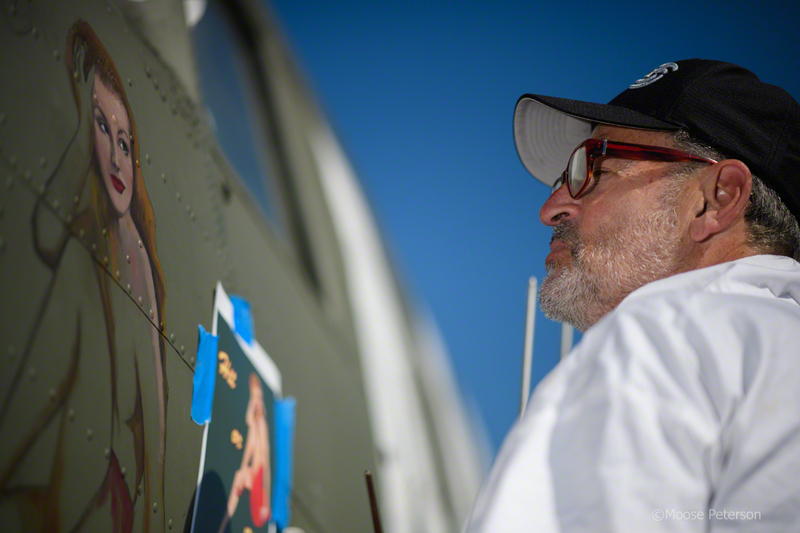 Commissioned to paint the nose art was the renowned artist Joel Iskowitz. 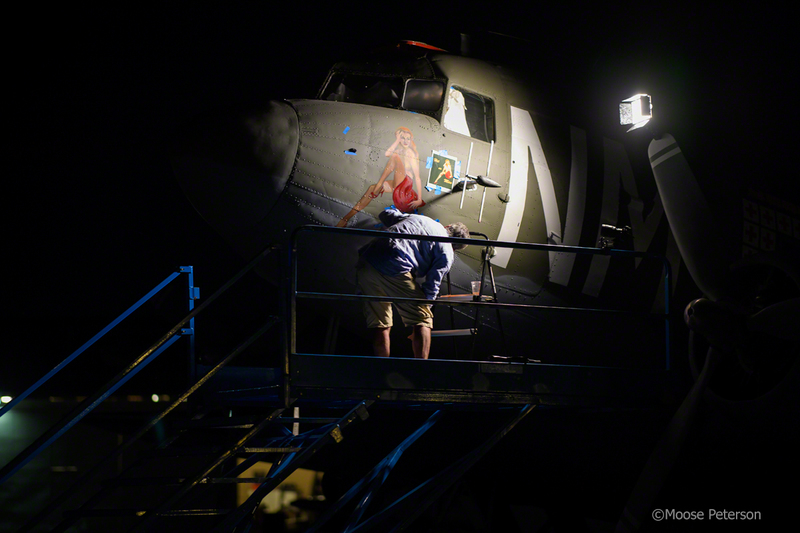 It was a two-day process for Joel, starting with drawing the nose art and then painting it all in. 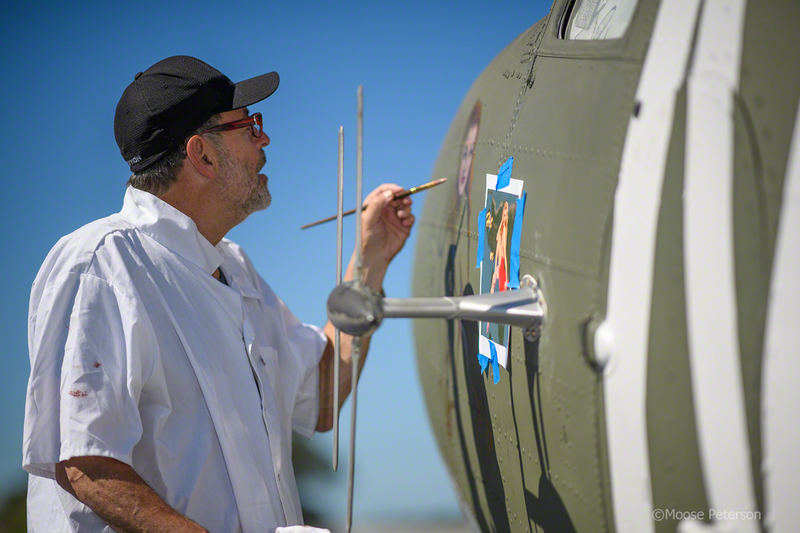 Joel used the same methods and paints they would have used in the field during WWII. It’s an incredibly time and labor-intensive process to imitate the vintage style. At the same time, being very talented, Joel’s blending of the colors to be accurate and true took him into the night to meet his goals for the day’s work. 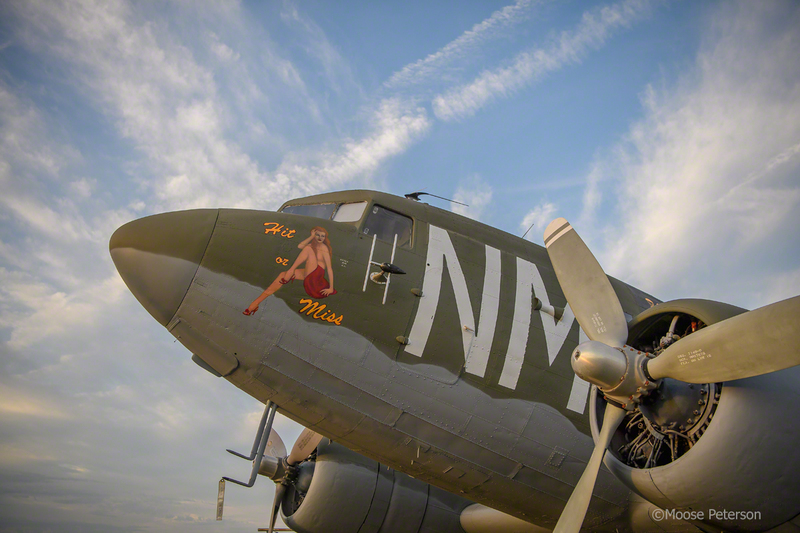 Joel’s work is spectacular and in the end, we asked what the name of the gal was in the nose art. Joel named her Gloria. More minor details being added to “Hit or Miss” is its war mark. A tradition in WWI with fighters was to paint victories under the canopy. 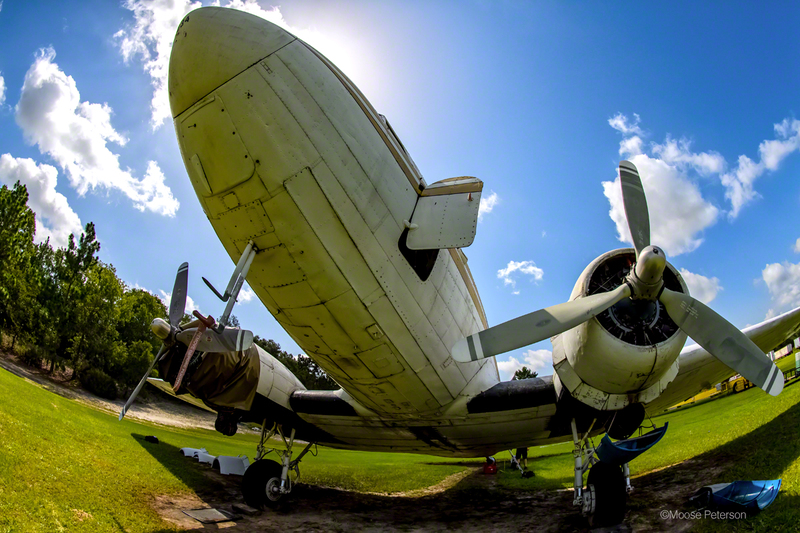 Bombers would paint their missions on their nose. 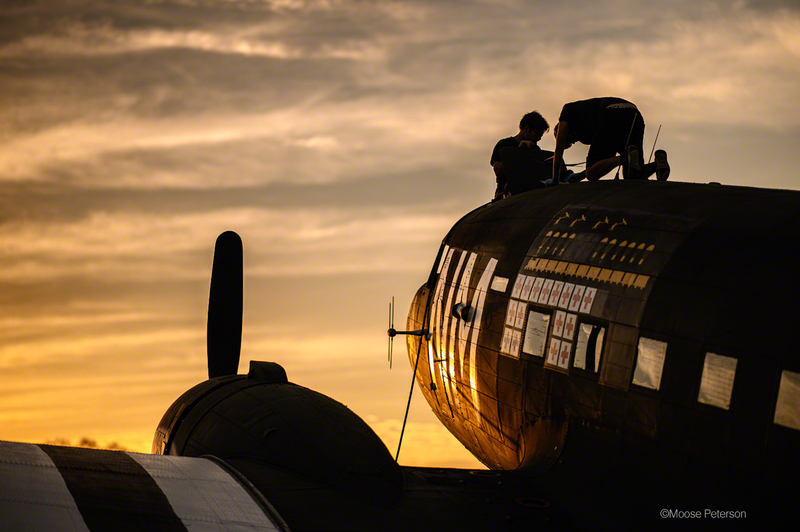 And many crews of transports like the C-47 had their missions painted on a mark of black over the wing. 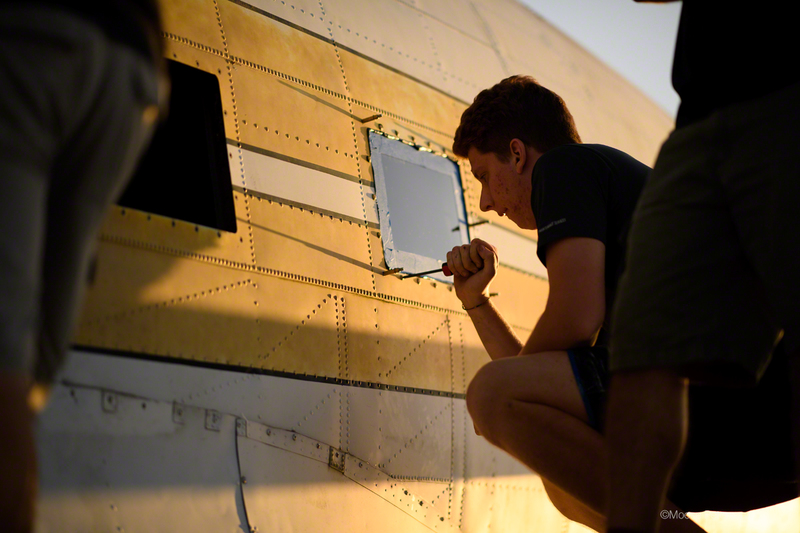 Our #43-48950 actually has more missions then could be painted on the fuselage, there wasn’t enough space. Being accurate in the shape, color and the “free hand” nature of the art was quite a challenge. 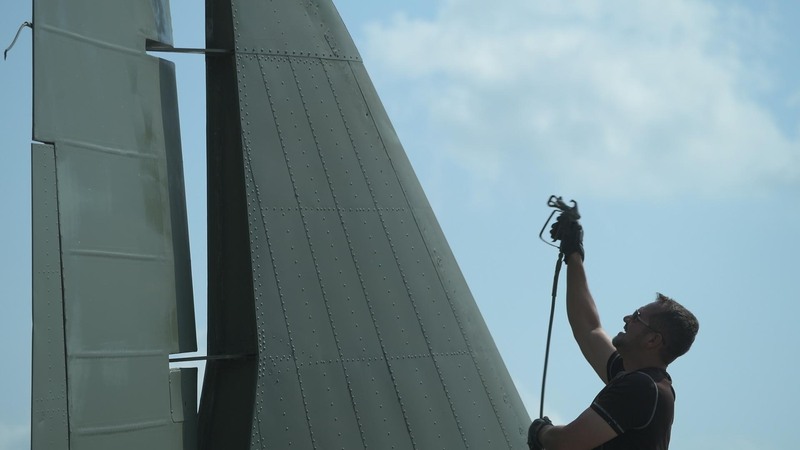 The Italians had finished all the inspection and repair to the alerion so covering could commence. Sam and Davide had never applied fabric, an old and dying art. So as with so much that happens with “Hit or Miss,” another teachable experience. While it might have taken longer than if done by an experienced craftsman, the work The Italians did turned out impeccable. One of the all-nighters found Frankie mounting “The Football” under the front nose. Being attached to be authentic to factory specs but not operational, “The Football” took a bit of effort to be attached. 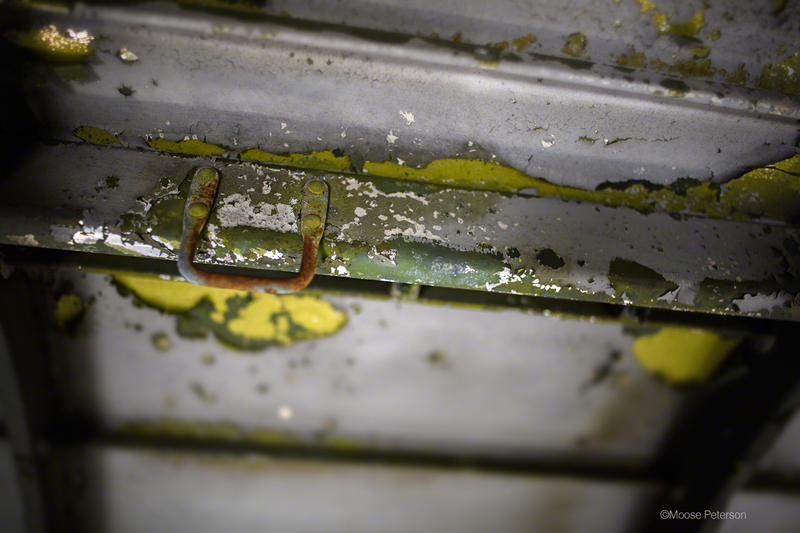 The metal was buggered up where the original one had been attached at some time in the past. So, those holes or exact location could not be reused. Frankie had a heck of a time finding a place structurally and symmetrically suitable that was also an accurate placement. While the process started in the daylight hours, it went well into the night until done. By the end of the four days, the personality of “Hit or Miss” was clear. 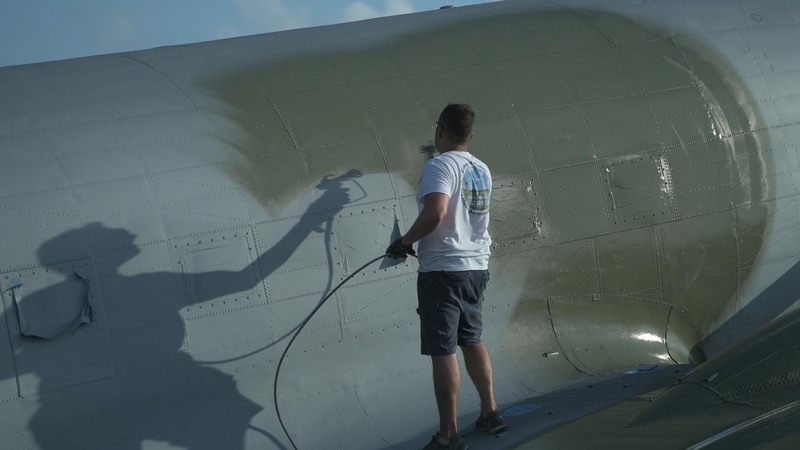 With all the new paint, she was starting to shine and to make her more accurate, the paint was being done now so by June it is “weathered” and looking as she would have in 1945. If it weren’t for the paint, the four days of progress wouldn’t have shown, it was all about small details. The push is on, getting the last big mechanical chores started and finished up. 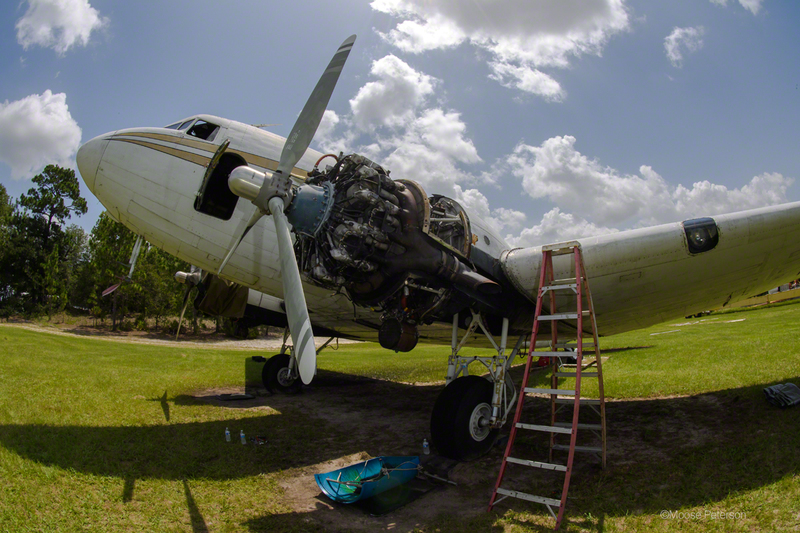 At the same time many of the exterior details were getting some needed TLC. 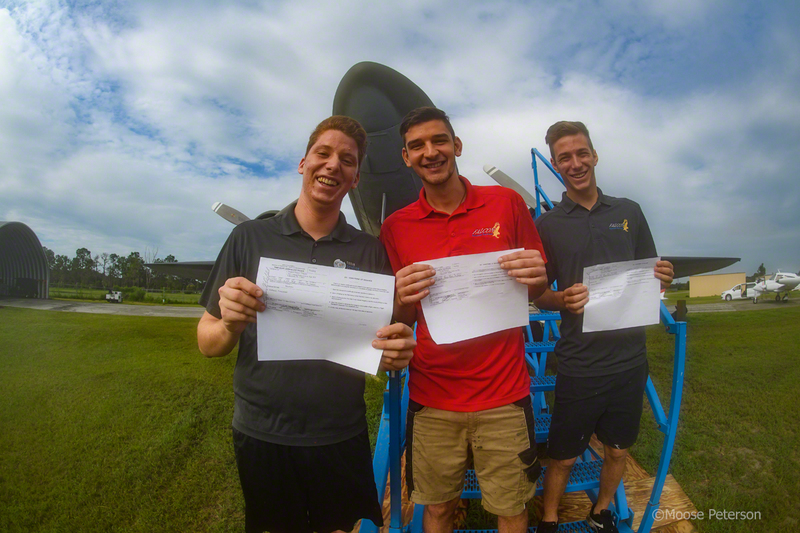 It all started in grand fashion as “The Italians” has passed their tests and got their A&P license! The “kids” are a powerhouse of energy and work ethic and it was great to see them rewarded for all their hard work. What a way to start this session on #43-48950! Two new volunteers came on to start the painting detailing work. 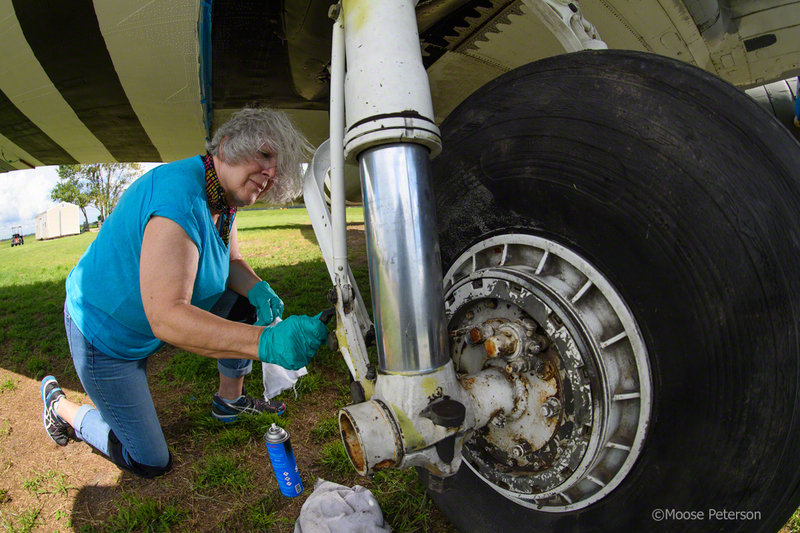 Richard and Carol had the unenviable task of cleaning the under carriage and landing gear in prep for painting. 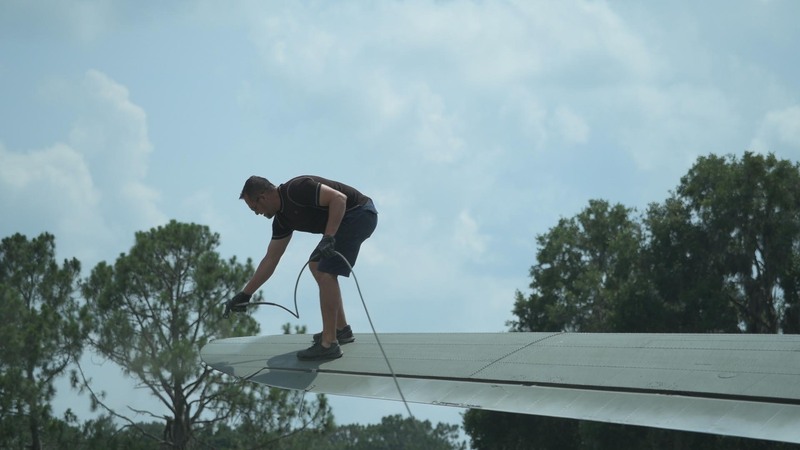 This is a tedious job in the hot Florida sun. This area of #43-48950 is where much of the motor oil gets thrown. All the nooks and crannies have to be cleaned so paint will stick, a time consuming job these two volunteers crushed in their three days on the station. 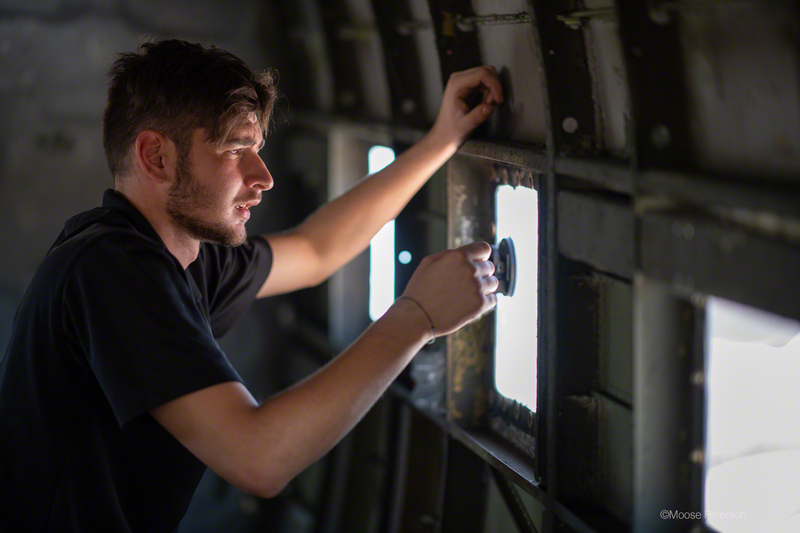 It was determined that the main cockpit glass was just too shot for the flight to and from Europe. So, it had to come out. As you might imagine, it just didn’t want to pop out. It took old fashion strong arming finesse to get it out in one piece so it could be used as a pattern for the new windscreens. 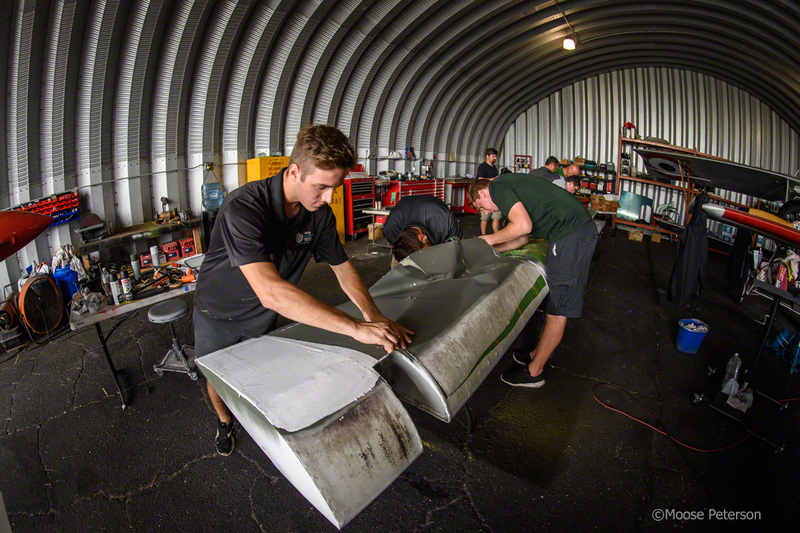 One of the big tasks awaiting the “Hit or Miss” crew was the removal, inspection, and recovering of the starboard aileron. 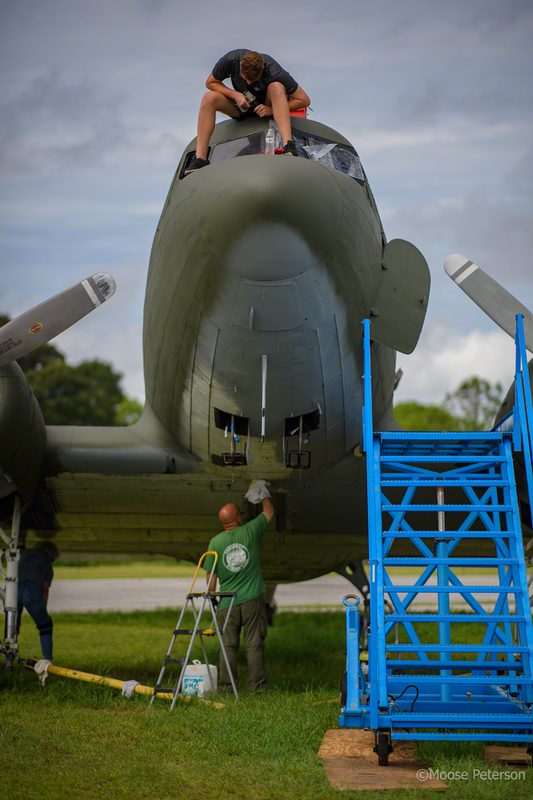 There is very little about “Hit or Miss” that isn’t a learning experience, be it its history or its restoration and this was definitely one of them. Ed had done many before but this was the first for The Italians. 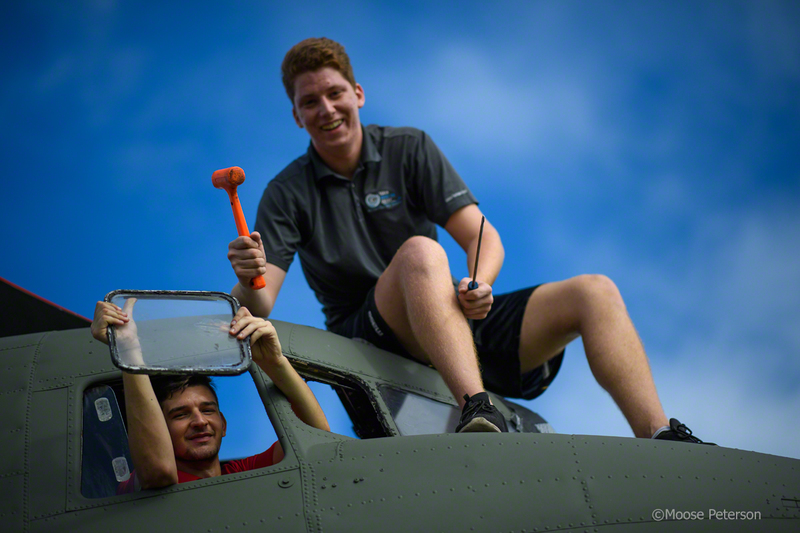 For them, the removal of the aileron was definitely a teaching moment. 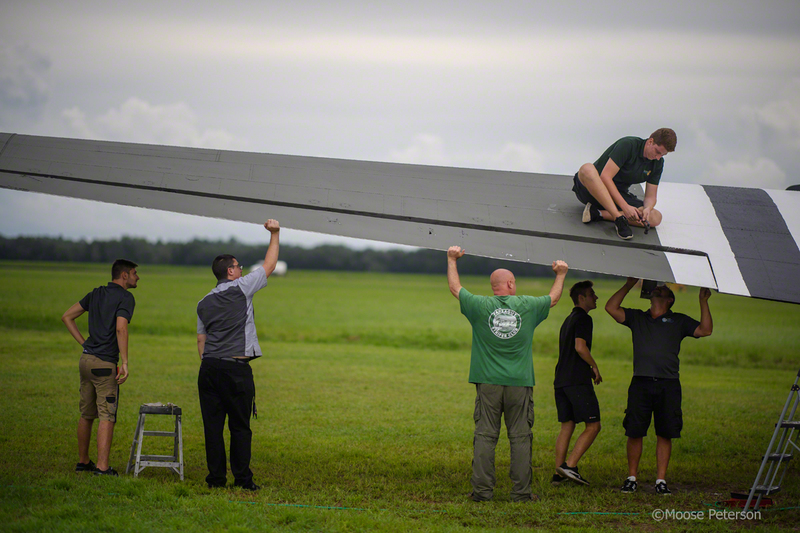 It’s hard to understand just how large a gooney bird is until you see all those hands on just the aileron! It was removed and carried into the shop where the old cloth covering was removed and the internal structure inspected. 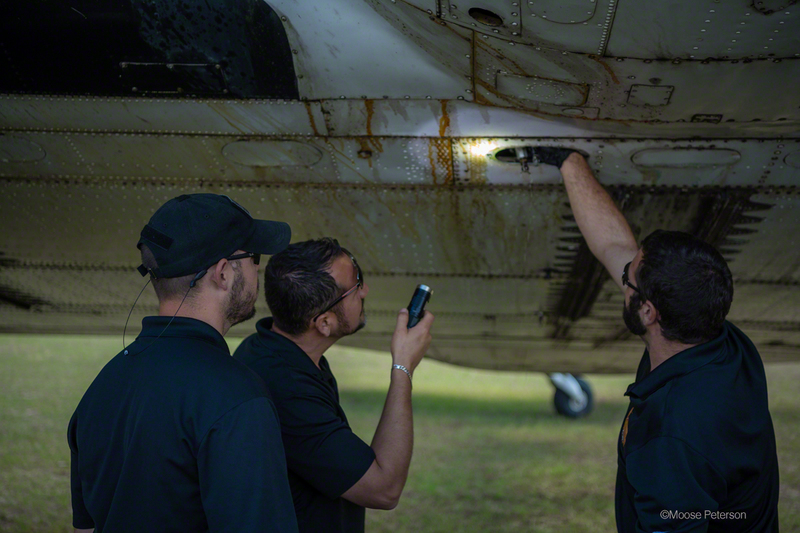 Old repairs and on the leading edge where double checked, any corrosion issues marked, and a plan of restoration created. Another of those learning moments was how the wingwalk was done back in the day. Today, many use a premade material that just applied down in a long one-piece material. 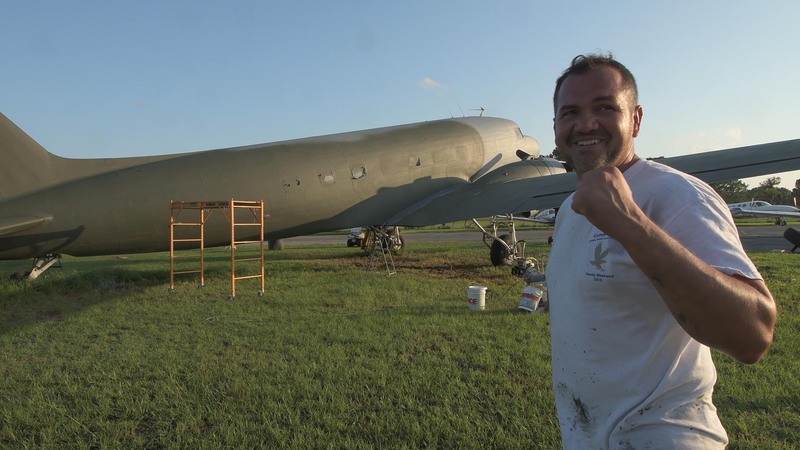 Back in the day, and still done today by most restorers, is the old school method. The surface is painted black and while still wet, sand is rubbed into the paint. Once that is dried, a second coat of paint is applied over it. This was a challenge in the hot Florida sun but it was successfully accomplished. 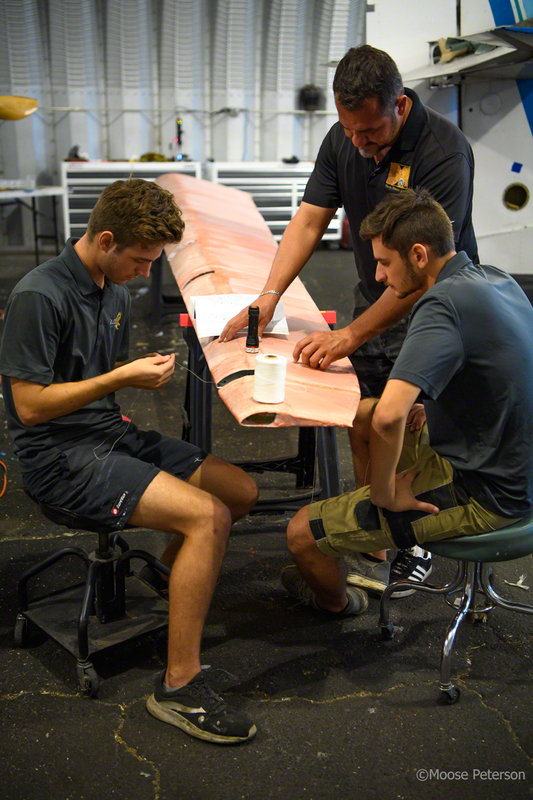 This same process is used on certain panels of the interior floor boards as well. First, they all had to be removed, stripped, inspected, and then the same process used to bring them back to factory spec. And as always is the case in Florida in the summer time you have the afternoon rains. We’re talking BIG rains and that brings much of the outdoor projects to a halt. 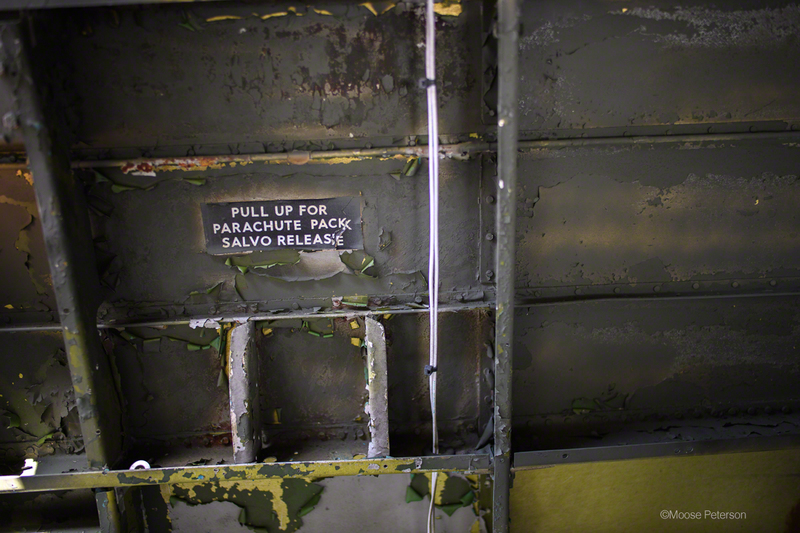 But not on the interior of the fuselage and in the shop. 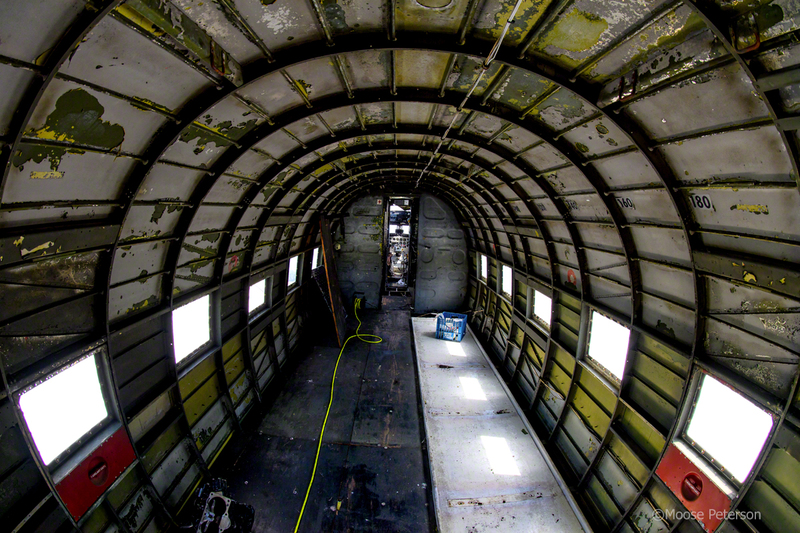 Inside the fuselage though, the humidity makes work really miserable, yet it continues. 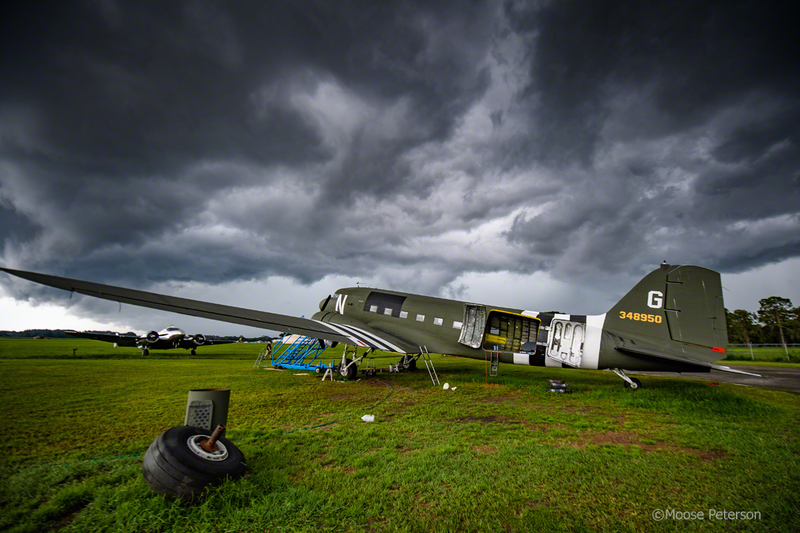 Inside the shop, the rain and hail can be deafening but just adds to the romance of working on a 1943 aircraft. And as is every day, work on “Hit or Miss” continued moving her closer and closer to returning to England in June, 2019! 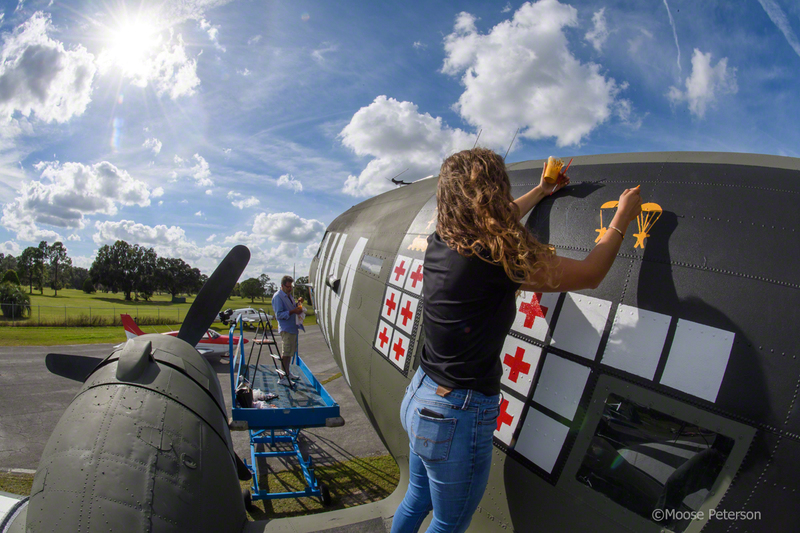 Ed and Sarah had to get paint, a lot more black and olive drab. 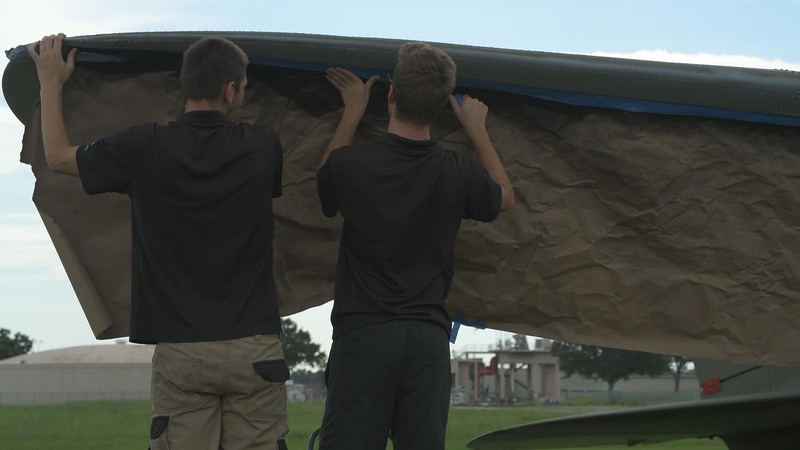 The interns had lots to do on the annual, so it was time for some extra man power. 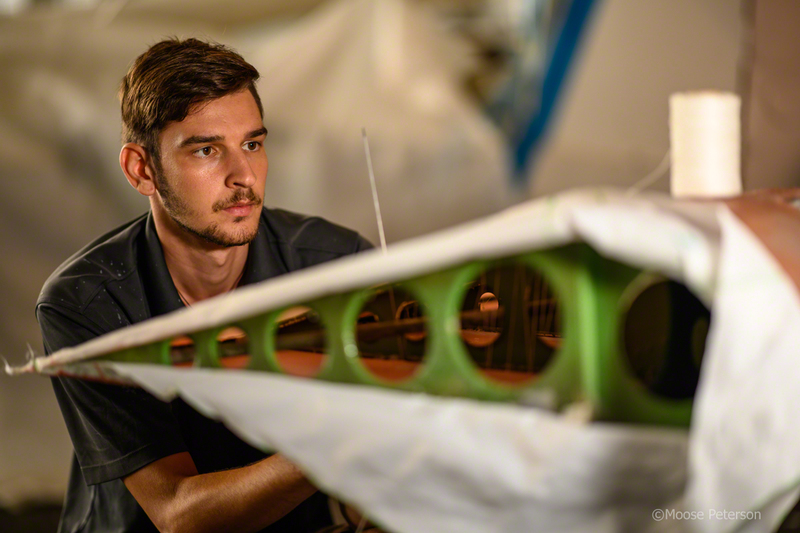 Davide helped taping part of the wing, but our volunteers arrived just in time to help tape and clean. 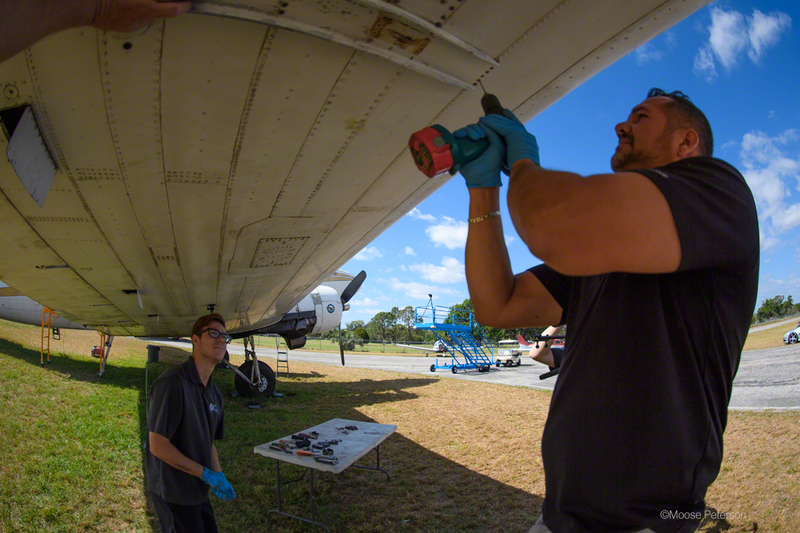 Jack worked with Samie to get the wings finished, while Jeremy cleaned the belly, and Barb and David cleaned the landing gear. Everything being cleaned needed to be painted, and the hydraulic oil left quite a mess. It grew dark as everyone cleaned. Davide finished up some new seals on the emergency exits. And only just in time. 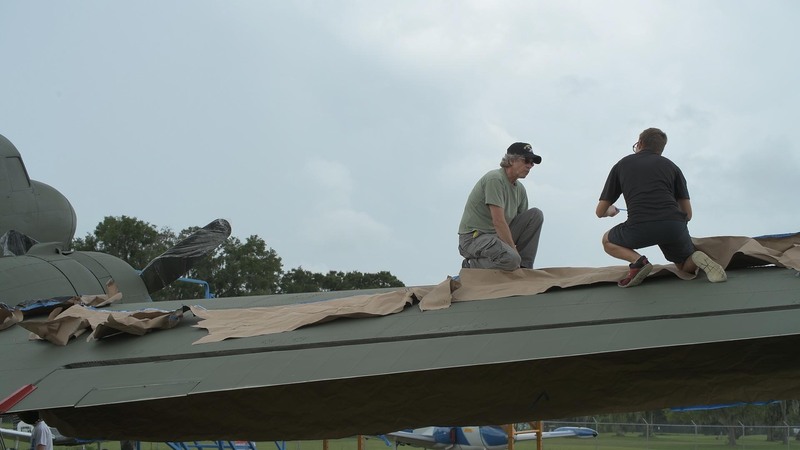 The storm started up, bring wind and rain, pulling off all the paper the guys had gotten in place. Ed and Sarah returned, and after taking stock of where work was at and the weather forecast, it was time for lunch while the weather passed. After lunch, the rain slowed enough that it was back to cleaning. 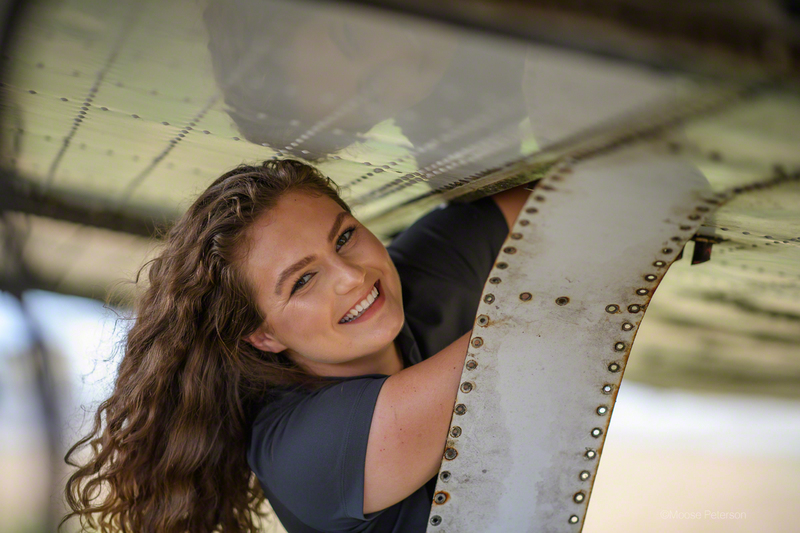 Sarah keeping everyone on task, got the guys to grinding the cargo door. 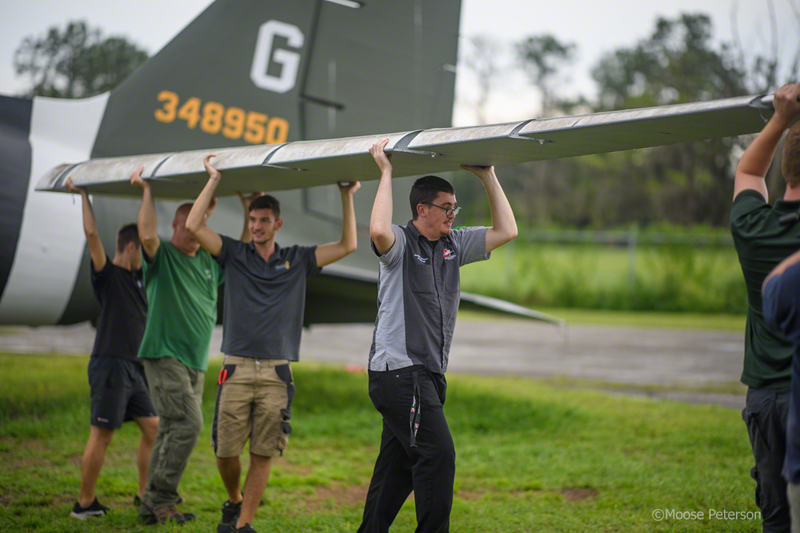 Eventually our volunteers headed home, the aircraft belly clean. The afternoon had gotten warm, the clouds had mostly dissipated. Ed made the call to keep painting. The guys retaped the wing quickly. Fortunately, only the paper blew off, the fine tape line was still good. 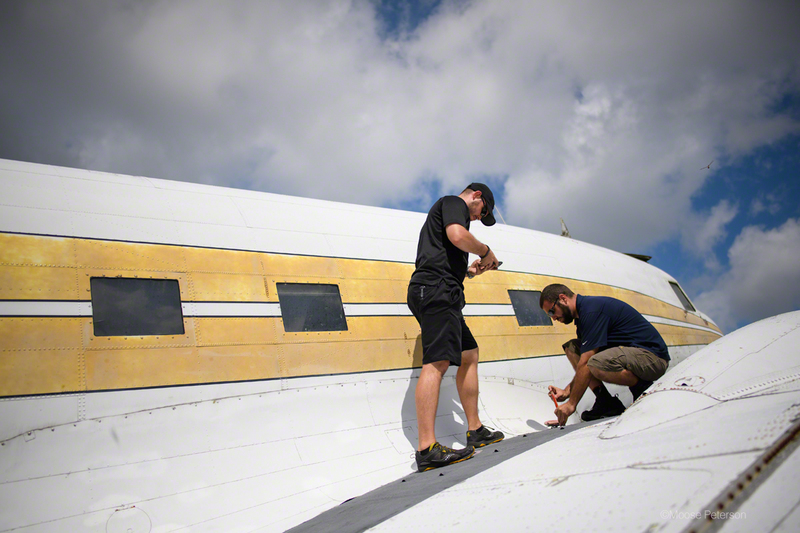 It was quick work then for Ed to get the other wing’s edge painted, as the guys taped up the tail’s edges. With the evening coming quick, the painting went just as quickly. 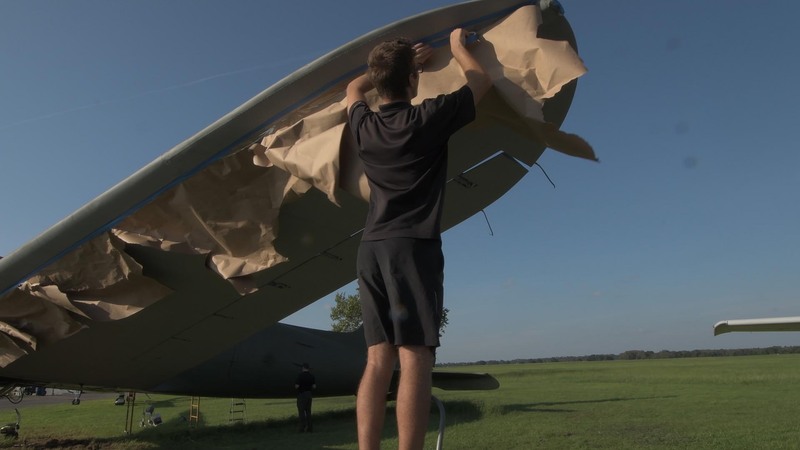 As the sun was setting, the last edge was painted and the tape removed, just in time to get dried by the last bit of sun. 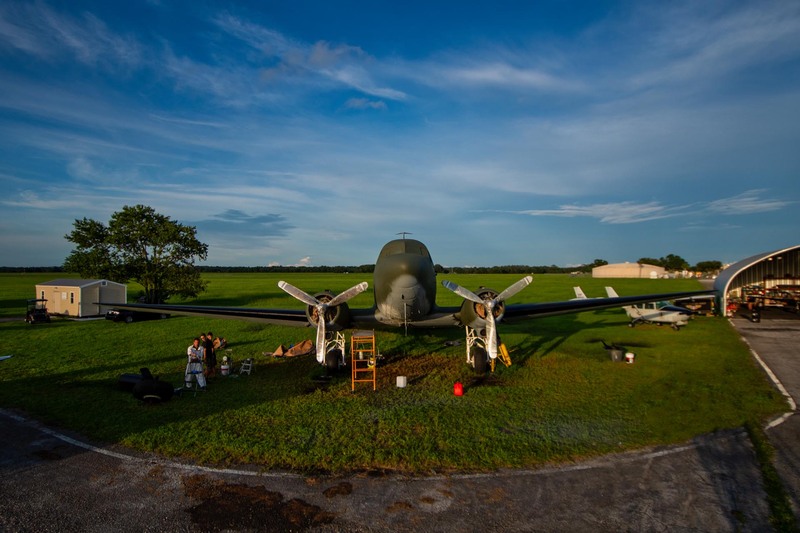 The change from the beginning of the week had been quite significant, and everyone on the field was ecstatic to see that one year before D-Day, the DC-3 had become the C-47. 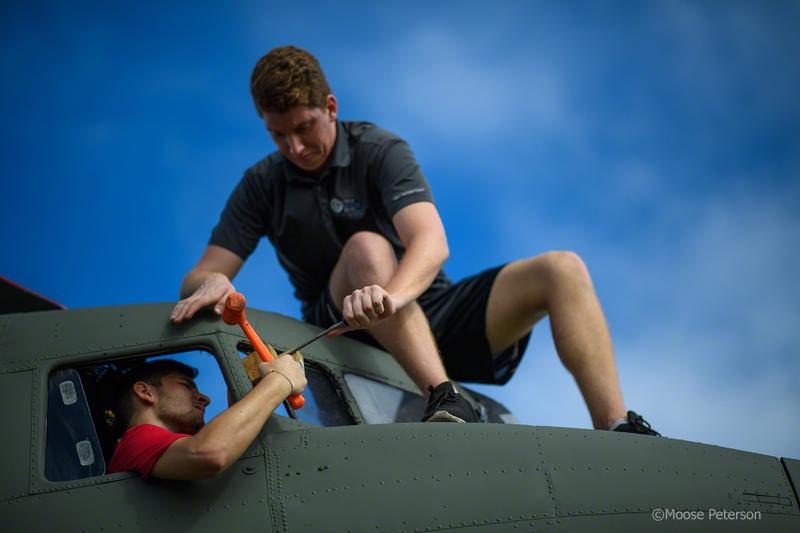 The interns were first on the field today, getting started on moving all the aircraft around. A private aircraft had to be fit into one hanger for an annual, Ed’s new widgeon had to be stuffed into the other hanger, and the C-45 was over due for having its engines exercised. 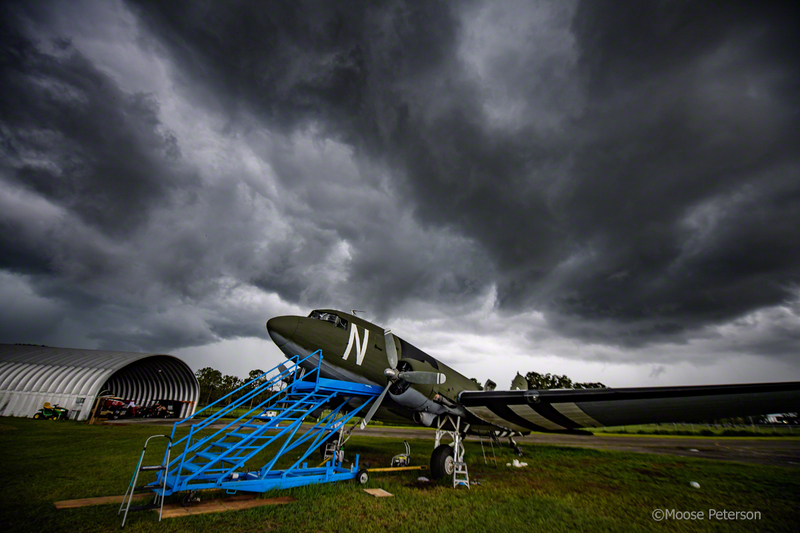 It would be a while before the C-47 would take priority today. 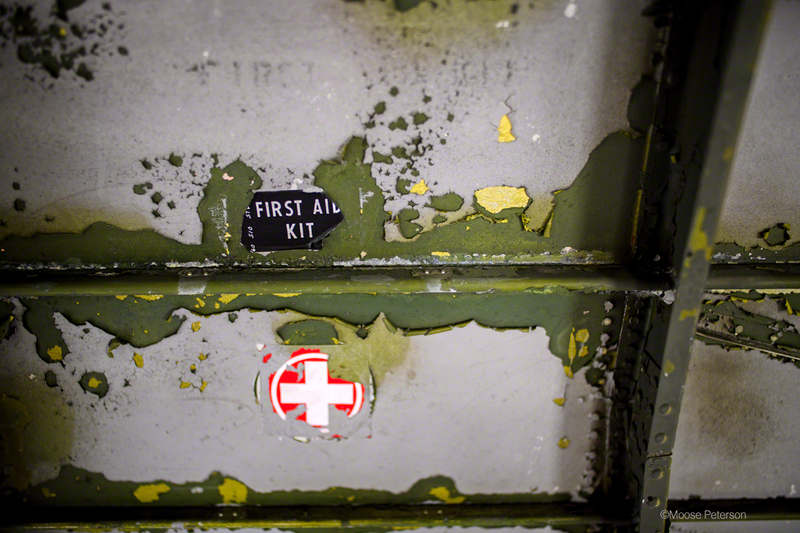 The C-47 had another hatch in need of refurbishing. 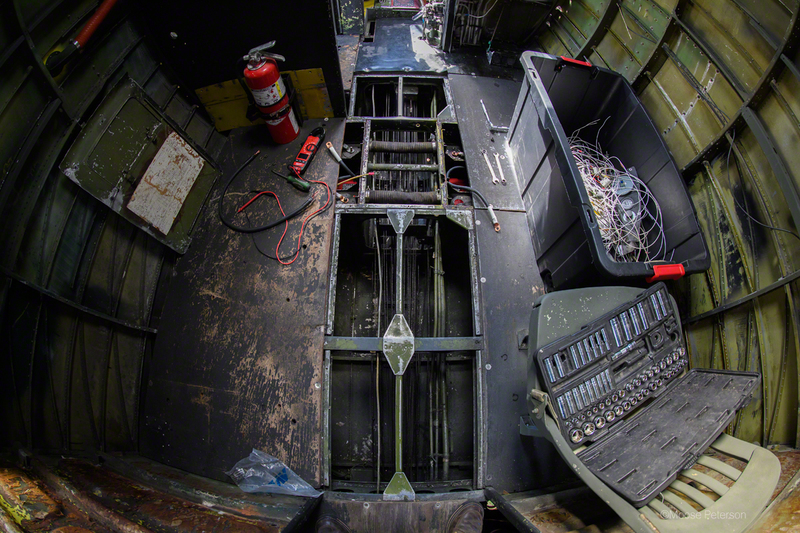 Samie took off the cockpit hatch and ground it down, removing years of corrosion and old paint, and soon had it primed. 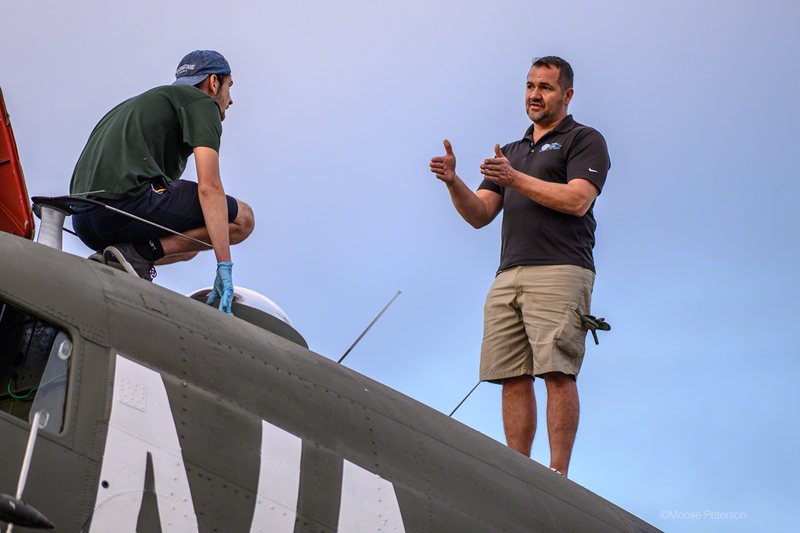 In the mean time, Ed and Davide took care of the C-45, giving it a good twenty minutes of running and taxiing; soon it would be ready to fly again. As if this wasn’t action enough, while the C-45 was away, Sarah arrived with the widgeon. 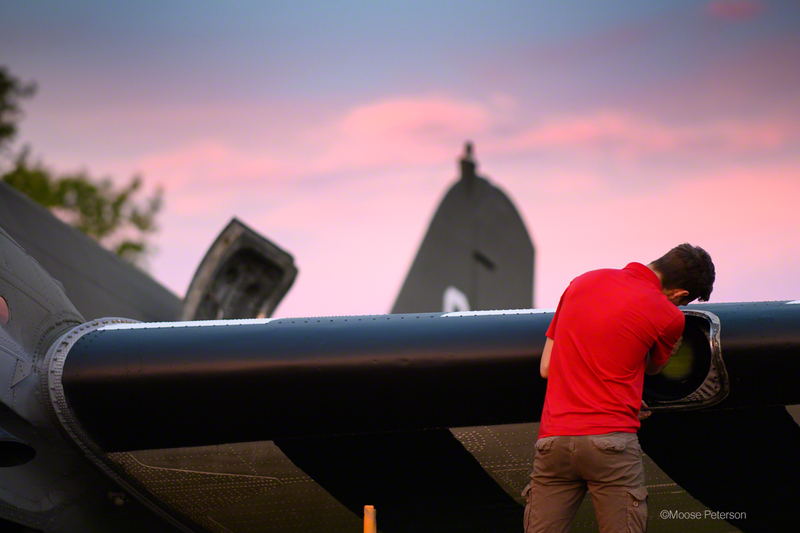 Back from the C-45, the boss takes note of the work going on. The priming looks excellent, and is ready to be painted emergency red. 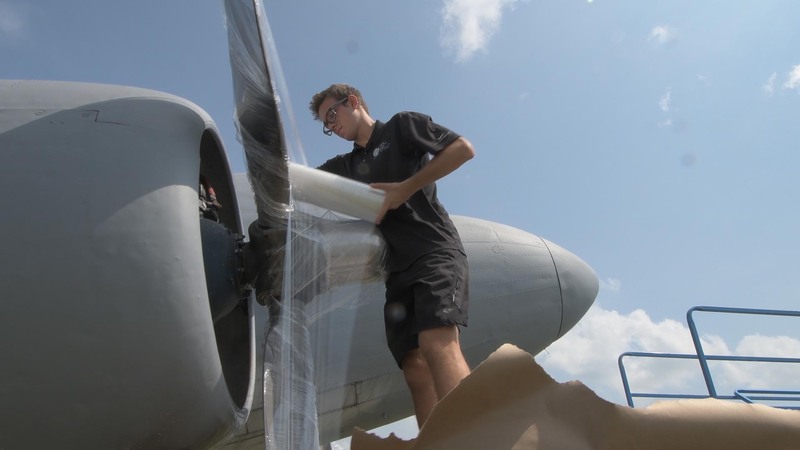 The widgeon made its trip safely; like the C-47, this plane’s engines were in good shape, but the airframe would need significant corrosion control and repair. But the widgeon was for another day. After changing into paint clothes, Ed took one last check on the emergency exit, happy with how the red looked and got started on the second coat. 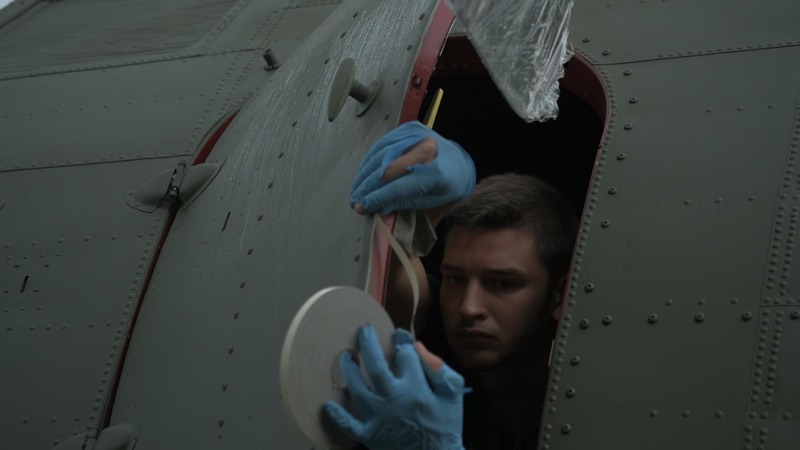 Samie and Frankie continued to prep the C-47 for painting, plastic wrapping the props and stuffing paper into the cowling to prevent paint from hitting either. The wind today provided quite a challenge as Ed blasted away. 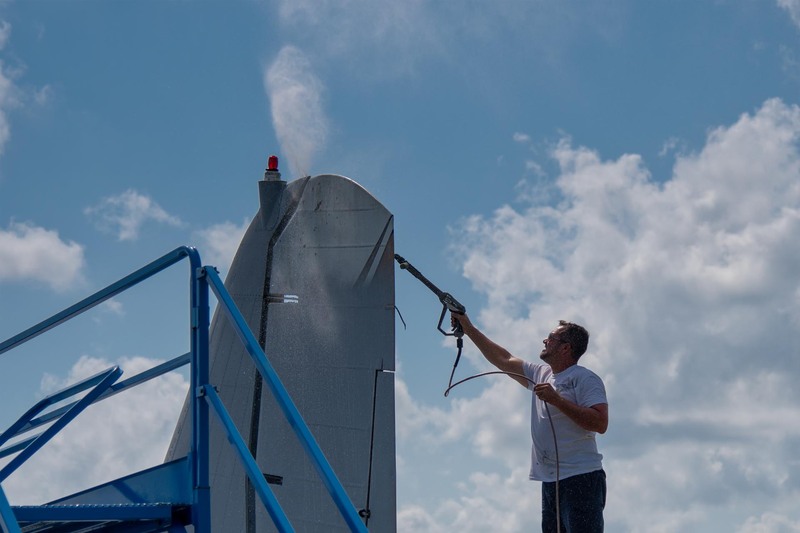 While it was plenty warm, the paint was applying thin, lots blowing away never hitting the plane. Painting from the nose down the back, it was most apparent and problematic at the tail, where the paint would not hit spots Ed was aiming at, blowing away instead. 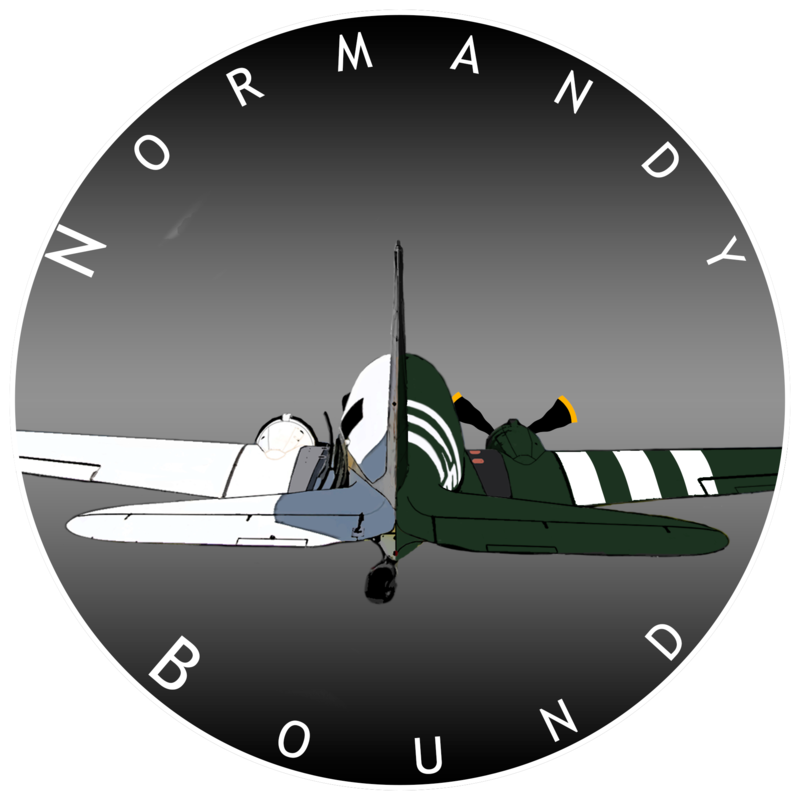 Switching to the blue walkway, Ed finished up the nose and cowling, careful to not go too low with the olive drab as it needed to blend correctly into the underbelly grey. 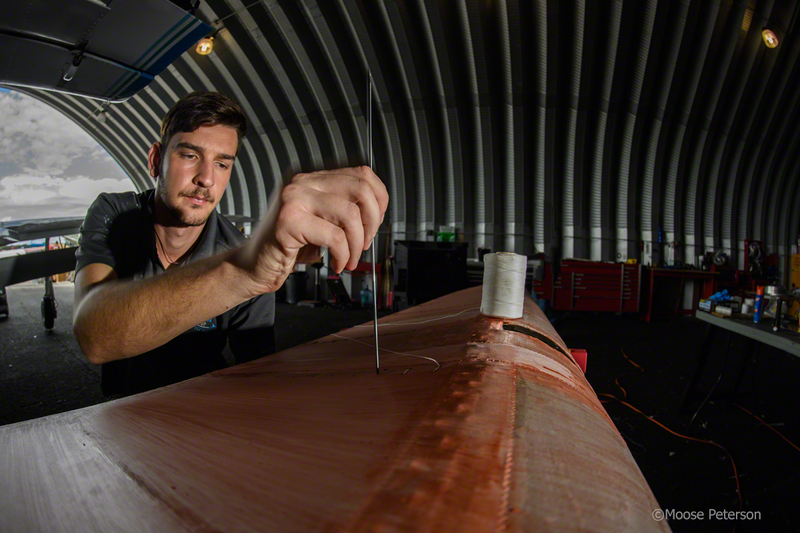 As Ed finished the second coat, Samie and Davide started taping the lines for the leading edge. 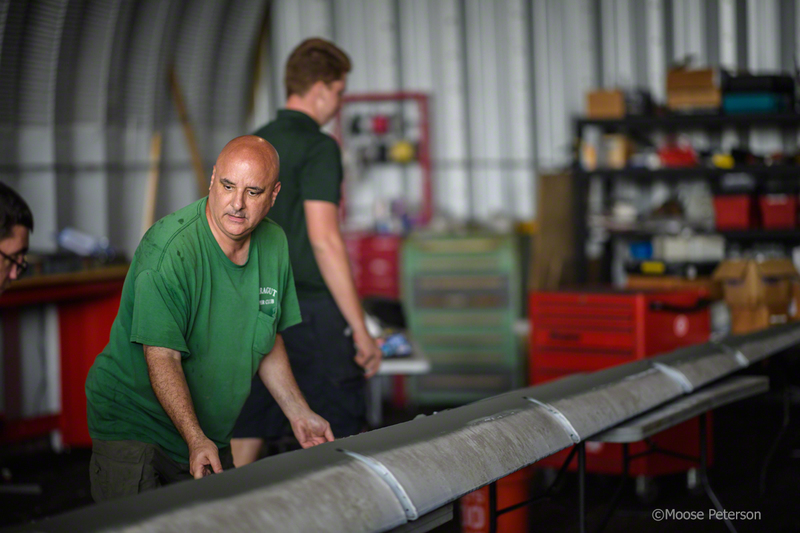 It was not long before Ed came to check and noticed the leading edge needed to taper off more than they had taped. 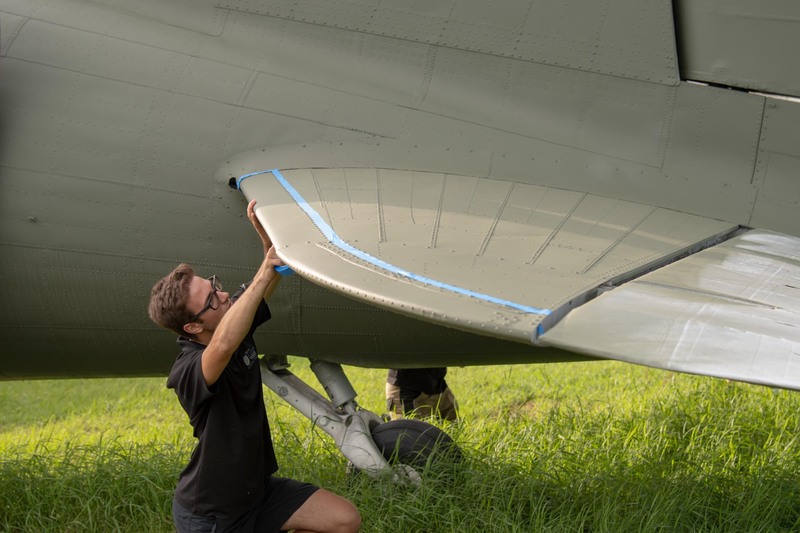 After ten minutes of checking various images of C-47s on their phones and discussing the best rivet line to follow, a plan was made, and taping continued. The paint having dried, and having finished checking on everyone’s progress, Ed returned to the back to hit a few spots he missed. With guidance from the ground he was able to touch up, as some places were out of his sight. 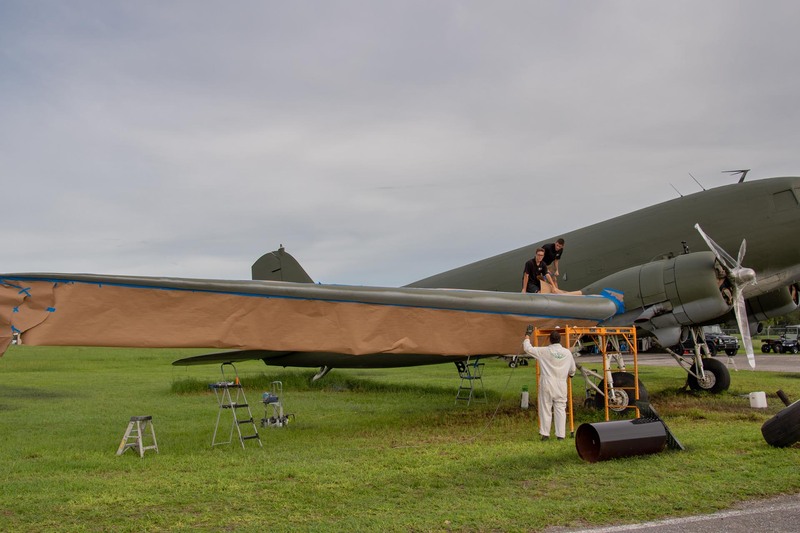 The wind had died down a bit too, allowing Ed to finish tail and some other areas that got lightly painted. 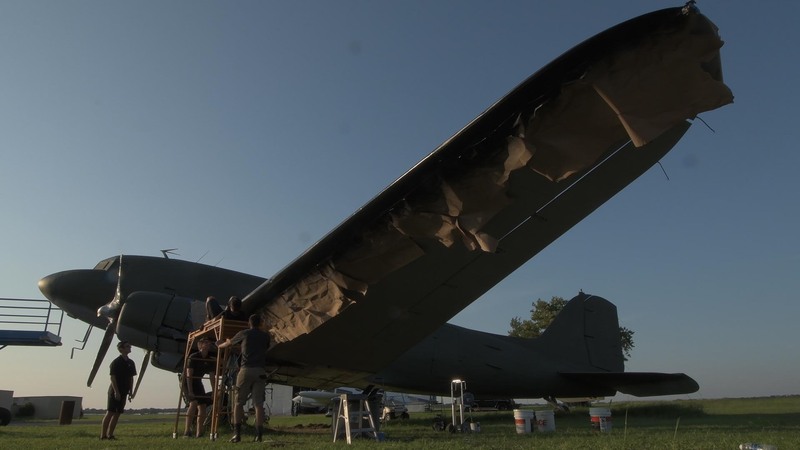 By the time everything was ready to paint leading edge, the sun was low, and concern was mounting about there being enough evening heat to dry the paint. The team employed some automation at this point, Samie, Davide, and Frankie pushing the scaffolding along with Ed on top, painting the edge. It all worked, as was quickly revealed when the tape was pulled off, and the clean edge shown. The paint was the perfect black, looking just shiny and thick enough that it resembled a boot. It was time to take stock of the dramatic change that day, and plan for the next day. Thunderstorms had been forecasted. The first dry week in a month had arrived; the previous month having been rain and the next month will likely be rain. Painting outside is an extreme challenge, fighting spring weather in Florida bringing humidity and rain. Picking the right sunny days was crucial. 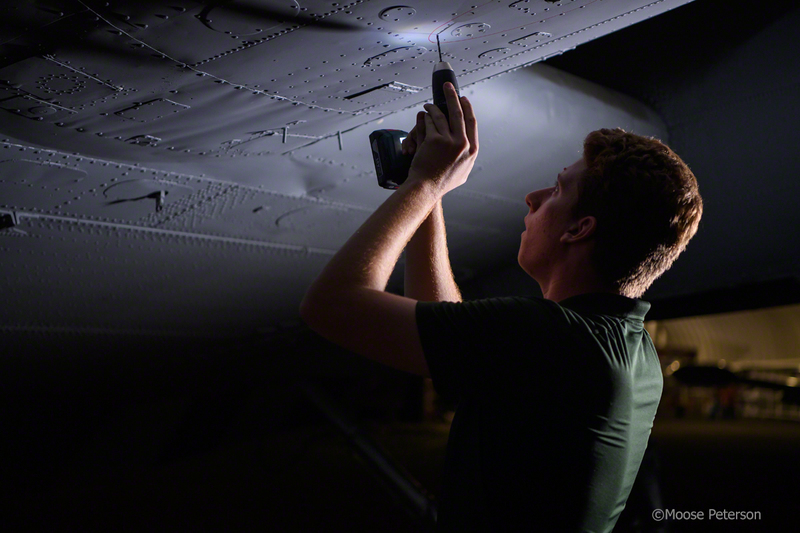 Time was short to finish cleaning, priming, and painting the plane. 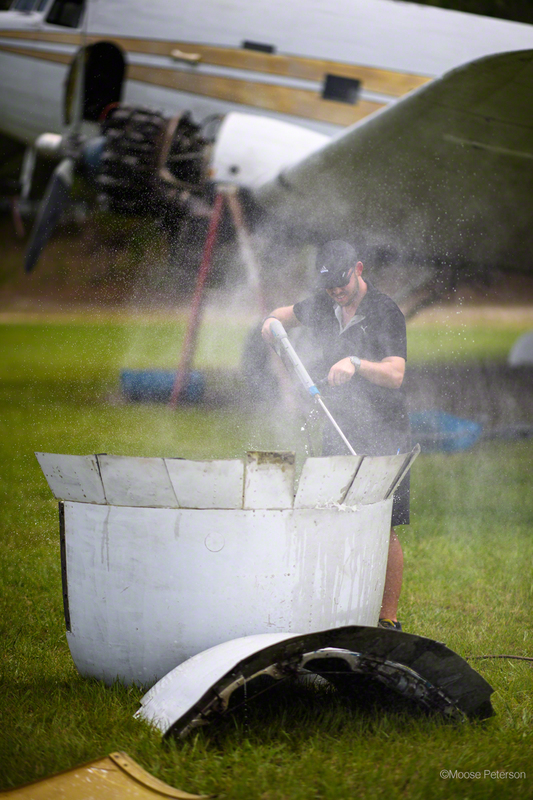 Powerwasher in hand, Ed removed the last of the mold and dirt that had built up on the control surfaces. The belly still had yet to be finished, but today was time only for the wings and fuselage. Since the interns were in class that day, it was only Ed and Sarah to get work done. 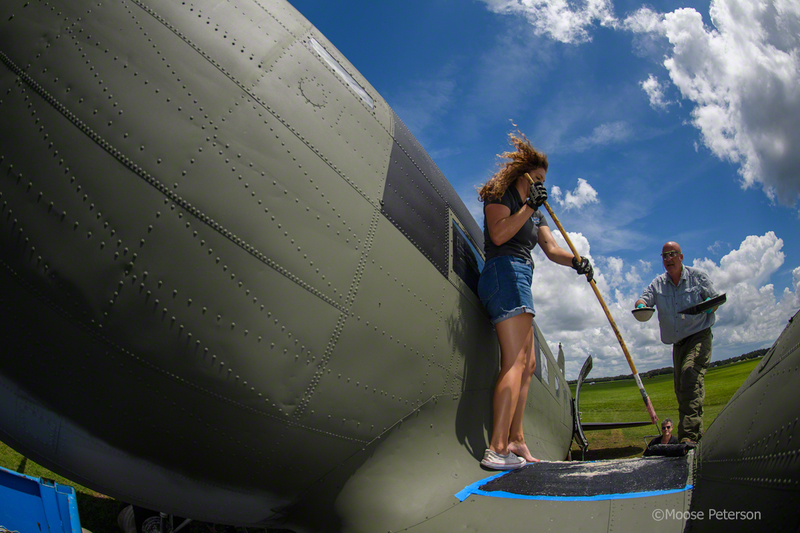 The hot day dried the plane quickly over the lunch break. 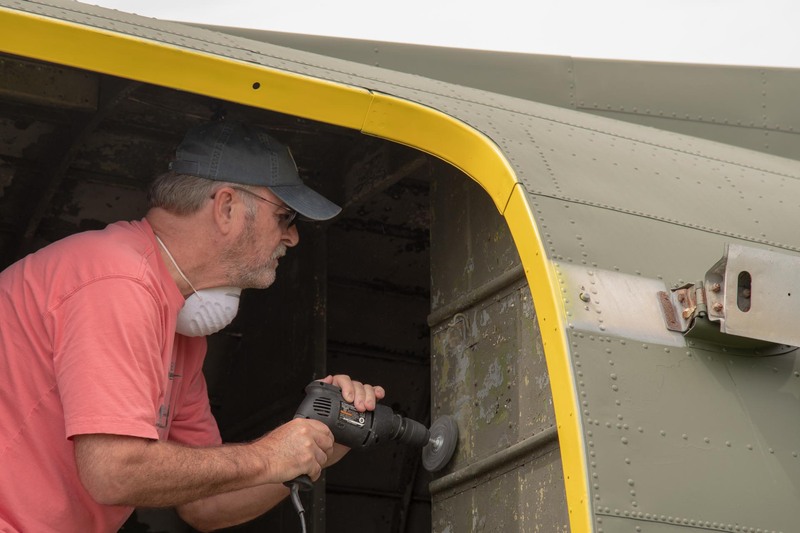 With his 5 gallons of olive drab, carefully matched to an original olive drab part from another C-47, Ed began on the right wing. It was only minutes as he covered the entire surface, skillfully getting the most out of his paint. 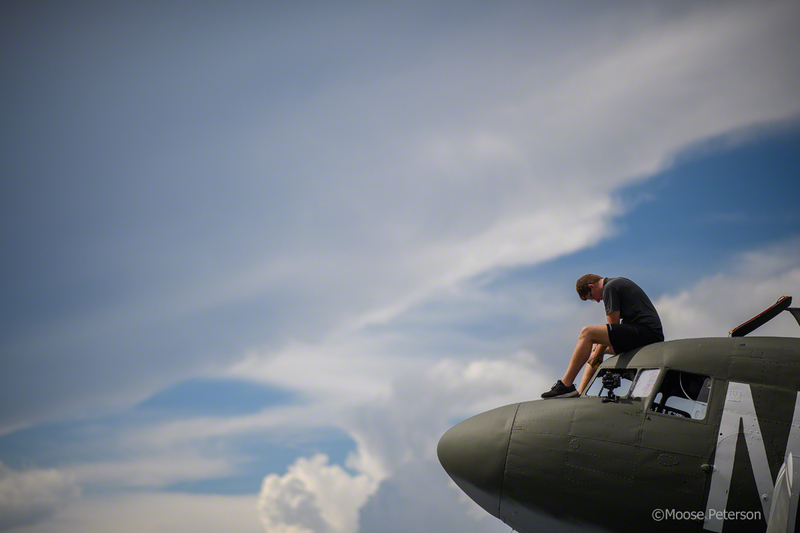 Soon he was on to the fuselage and down the tail. 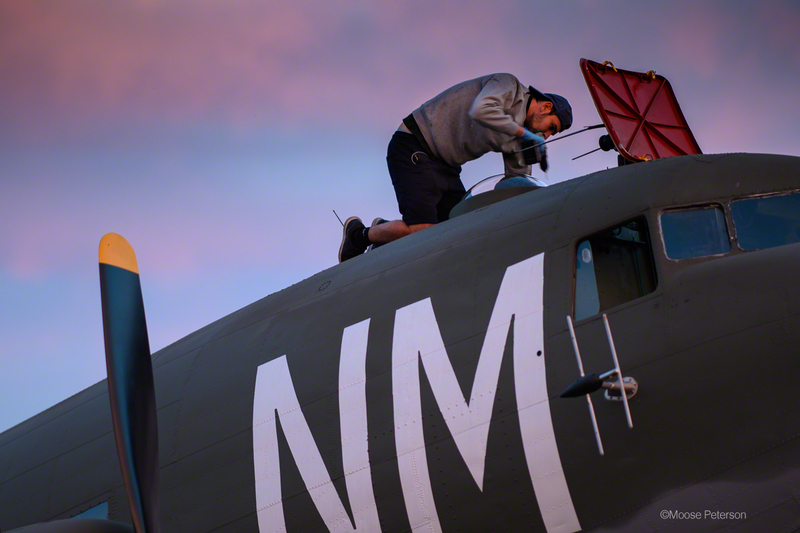 Having more paint left, he quickly switched to the other wing, blazing down it as well. As the paint dried, Ed became increasingly aware of his paint strokes. 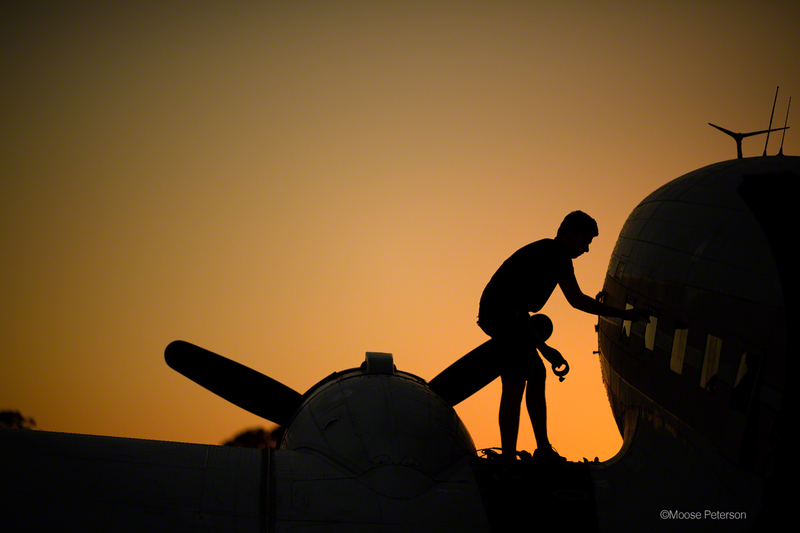 As the sun set, Ed and Sarah were astounded by the transformation that had occurred in only a couple of hours. But the imperfections in the paint bothered Ed enough that it was deemed a second coat was necessary. Another 5 gallons was needed. The day started exactly where we left the night before. 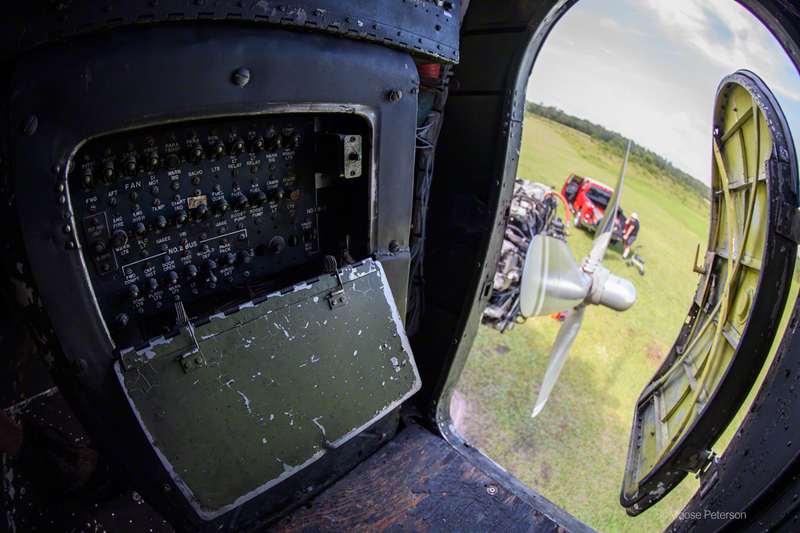 Only one side of #43-48950 windows had been replaced, seven windows on the starboard side. 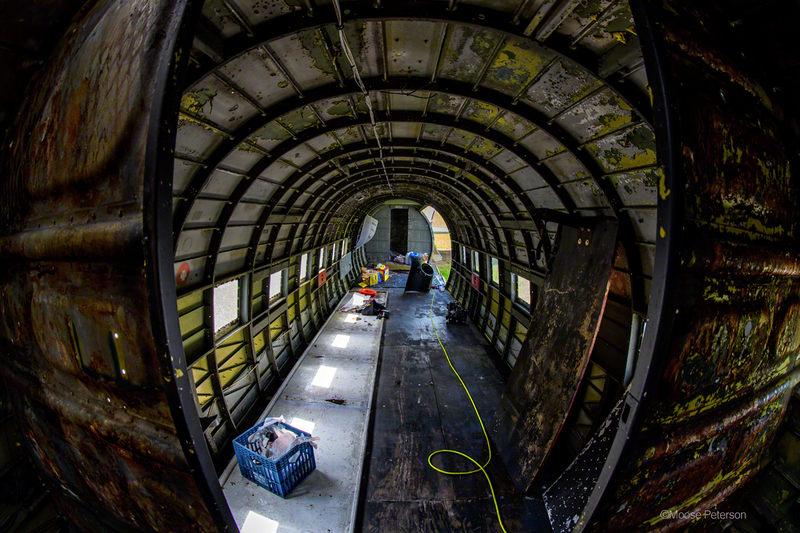 The six windows on the port side and the windows on the top of the fuselage were to be replaced today. Sam had finished the removal of all the plumbing on the starboard side the day before (with a big assist from Ed) so the port side was tackled today. 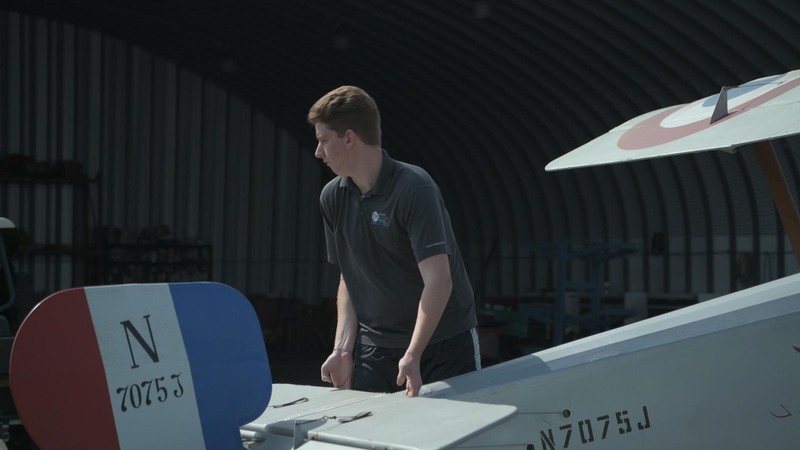 It was going pretty smoothly until he hit the seven foot, 6 inch wide panel under the fuselage where a hundred screws had to be removed to access the last fittings. Learning how to bust out screws without stripping heads and threads, Sarah pitched in to speed things up. 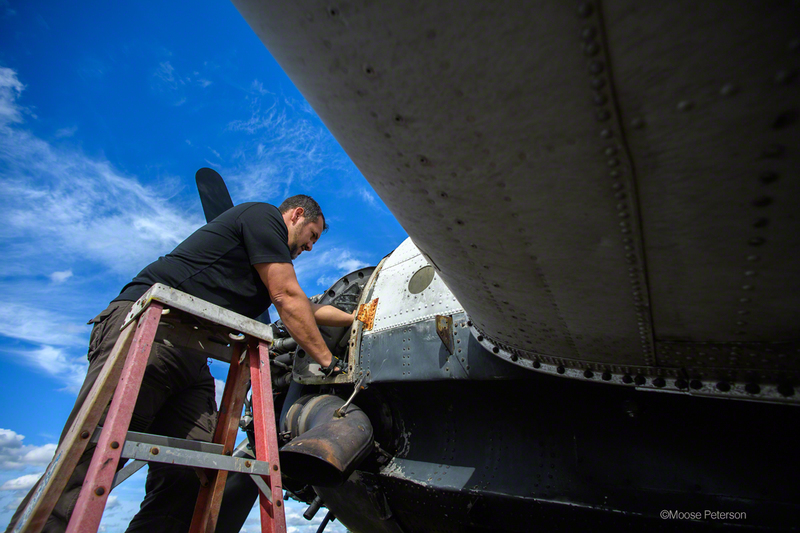 Filming of this process was a challenge with all the “stuff” better known as plane parts hanging here and there. 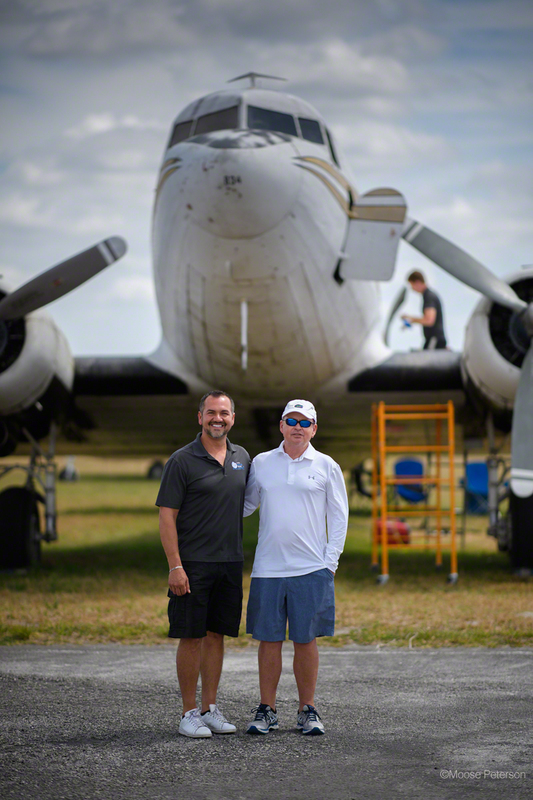 Work was halted for an early lunch as the son of the pilot who flew #43-48950 as lead plane on Operation Varsity was coming to see his dad’s plane for the first time. Turian Aviation did an amazing job finding him and getting him to the plane for a very emotional introduction to the grand old lady. 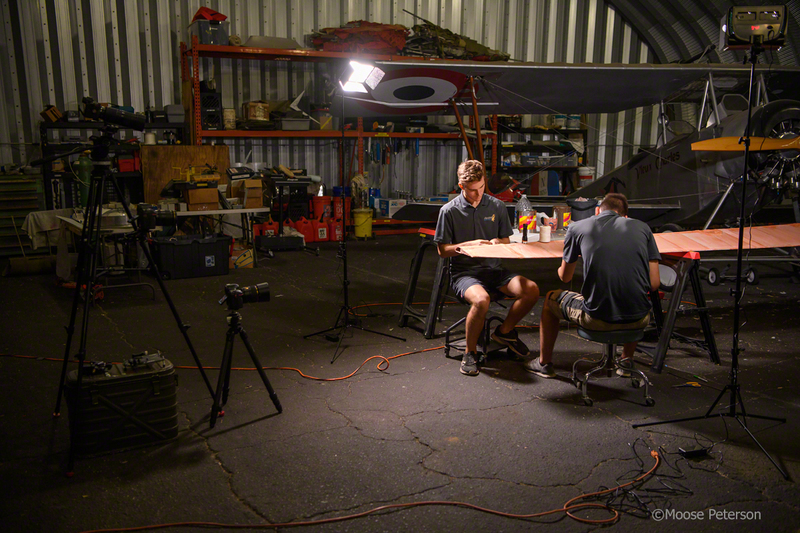 We cleaned up all the “restoration” tools, parts, and greasy rags from just inside the cargo doors and turned the inside of the fuselage into a “studio” to record the interview with the son. It will be a great piece in the documentary! By sunset, all the windows had been replaced. All the plumbing removed. At the same time, inspection of the next phases of work double checked, parts needing to be R&R assessed and lists of work accomplished checked off. In the three days a tremendous amount of work and progress had been completed on #43-48950. 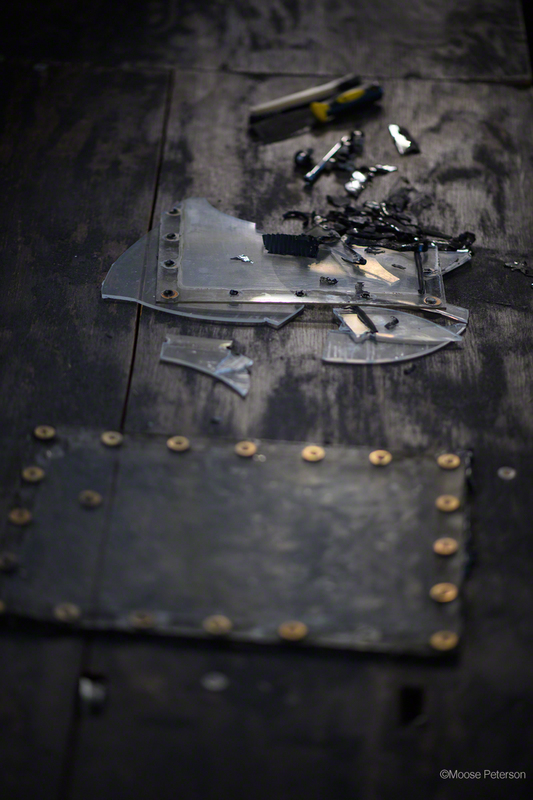 For our part, nearly 3TB of film had been shot and backed up! Man, what a great project! 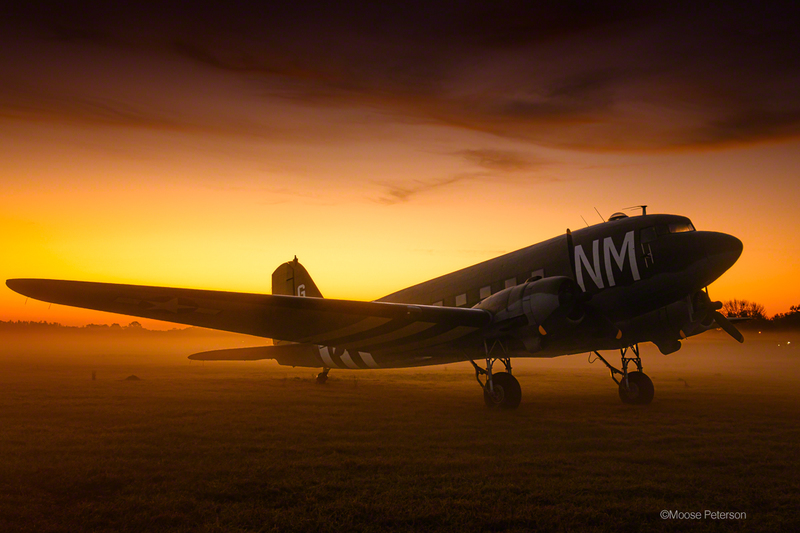 There is just something about being on an airfield to welcome the sunrise! The main “nose” time lapse camera had to have new batteries every eight hours. 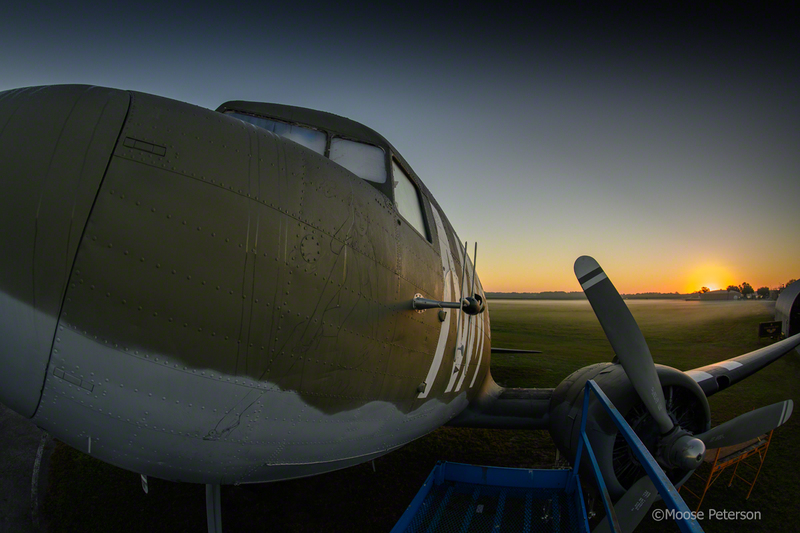 It was planned so this would be just after sunrise which meant we were there to see the sun come up over #43-48950. Before the ground crew had arrived, we had all the camera out, in place and ready to turn on once they started work. With all on the field, brief progress and planning meeting for the day’s work, by 09:30 all the cameras were rolling. There was a lot on the day’s planner. 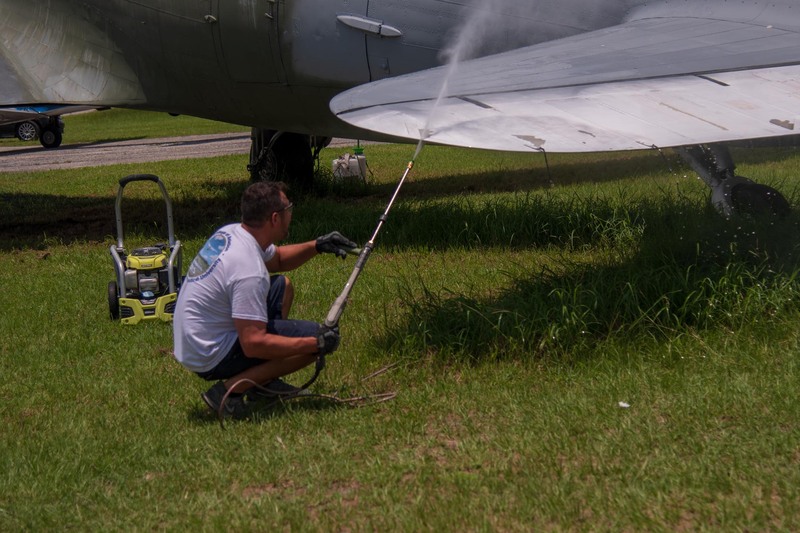 Sam & Ed started to tackle all the hoses, I’d call pipes and plumbing, installed in #43-48950 for mosquito spraying. 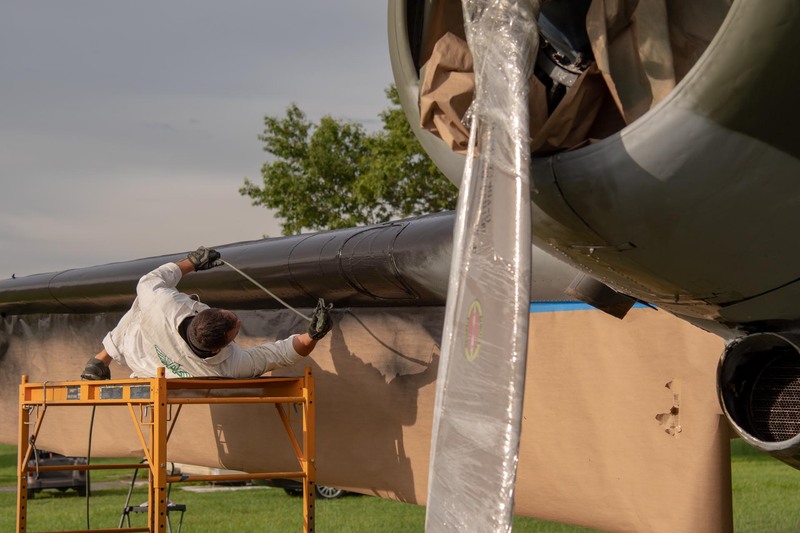 The installation job of what seemed like miles (only really 150’) the pipes and electrical in the interior of the wings and fuselage was a work of art! It was done with standards far and beyond what was required which in the long run saved #43-48950 because none of it ever leaked! It also meant that the task of removing it wasn’t going to be any walk in the park. Can you imagine having to stand, your arm shoulder-deep in a hole not much bigger in diameter than your arm, then bend your arm nearly at 90 degrees, worm your hand through smaller holes and having to remove two BOLTS holding a Del clamp that is holding the pipe to a rib? Then having to repeat this over and over again, forty times?! That is just part of the process of getting the piping removed! 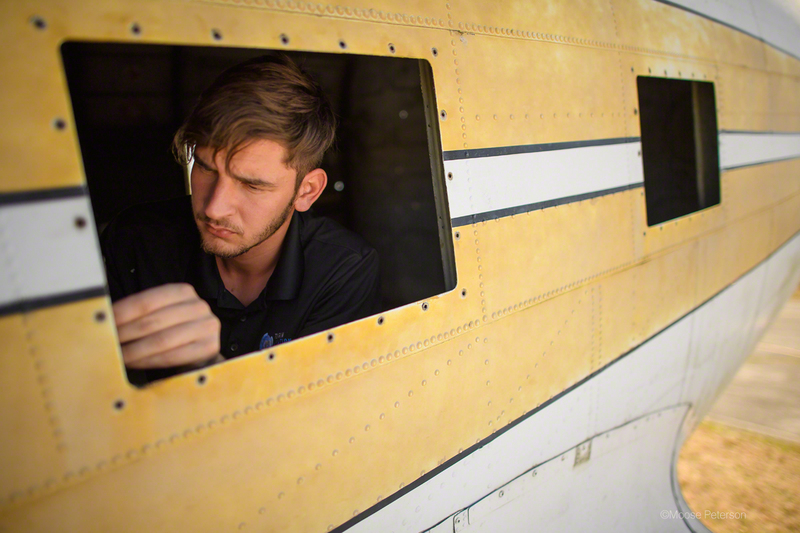 Time and man power is maximized and since only one person (Sam) can get his arm in that hole, David and Frankie went to work replacing all the windows on the side and top of the fuselage. The side windows were not factory windows; they had been replaced sometime in the past but because of age and sitting in the Florida sun, had a nice, perfect photographic frosting to them. Good for photography, not for looking out of. But like everything else done on #43-48950, the replacement windows were installed with great professionalism. This made the task of removing and replacing them time consuming. A large part of our day was spent manning all the camera’s batteries. The cab of our truck had every socket in use with batteries’ chargers which we were constantly feeding. We had started the day before sunrise and just at sunset, stopped the 24 hour time lapse. But we kept working well into the night and by the light of flash lights, finally wrapped up the day’s work and filming. Phew … whata day with one more to go! We hit the ground for what would be a grueling three-day marathon of work! 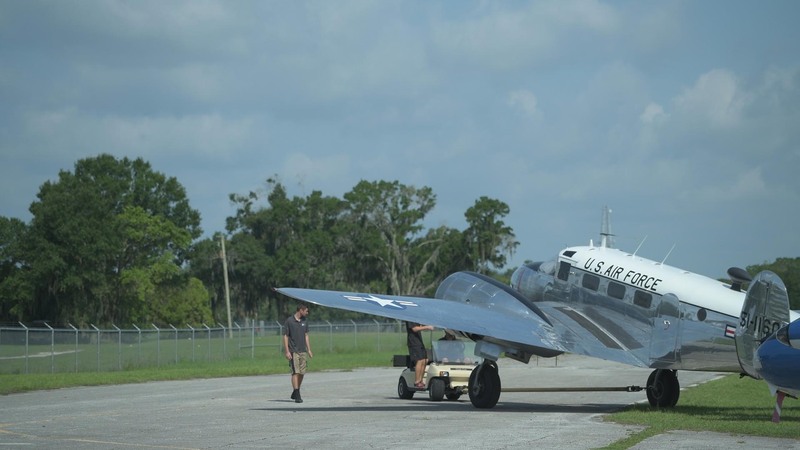 With #43-48950 finally at its home at Zephyrhills, the team at Turin Aviation started to dive into the now DC-3 to bring it back to its off the factory line C-47 configuration. 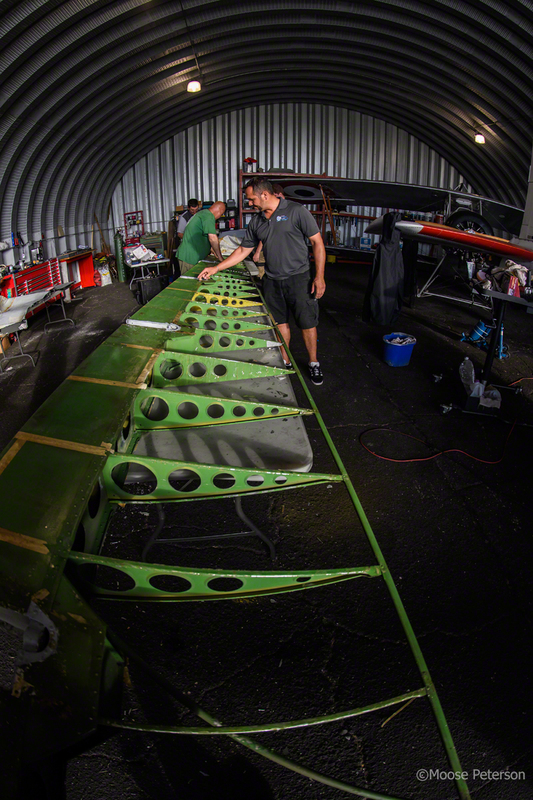 One of the tedious tasks to be done was an AD (airworthy directives) to replace ALL the wing attach bolts. 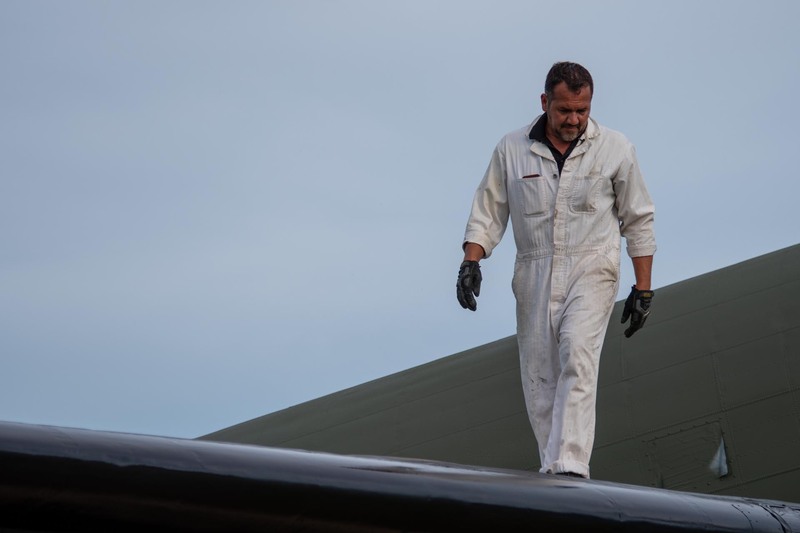 Each and every one of the 460 bolts had to be removed and new ones inserted, torqued down and then after the first flight, checked and torqued again to meet the AD. For Frankie, David and Sam, it’s just another day at the office. With assembly line precision, they finish going through, getting them all replaced. 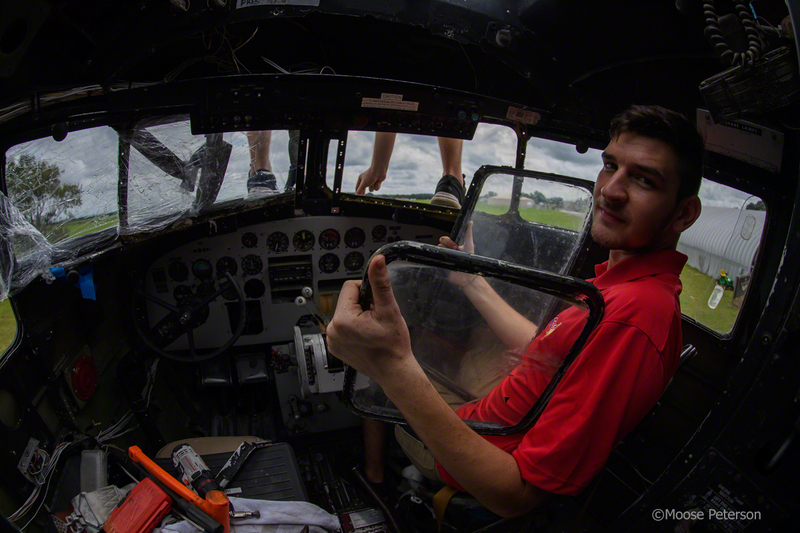 Jonathon was like a kid in a candy store as he started the task of removing all wiring from the cockpit that was part of the mosquito spraying operation. He started with the instruments added to #43-48950 not from the factory and then traced those wires back until their terminus. During this process, he checked all the factory wiring, fittings and connections as well. Not sure which task was more tedious, between replacing all the wing bolts and pulling out wiring. The bolts is really repetitive work. The wiring is a lot of walking, tracing, taking photos, labeling and simply thinking. It was a full day starting all these projects with activity really kind of stationary, not a whole lot of moving parts. 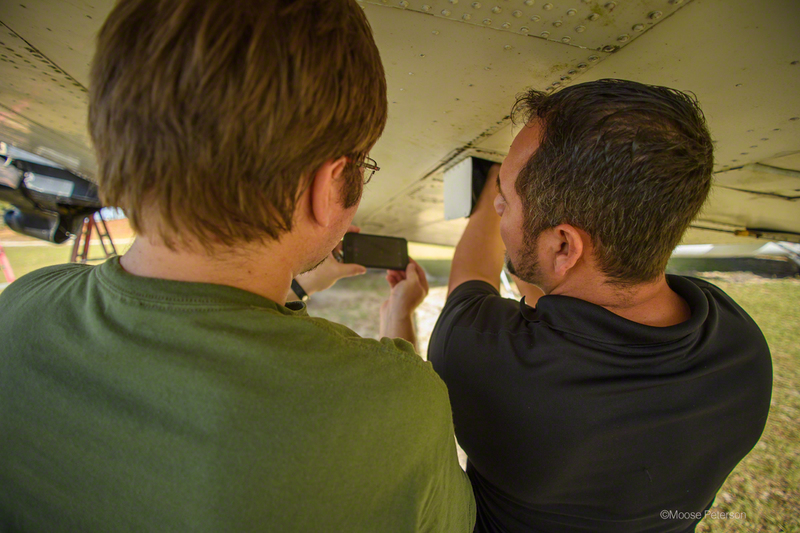 We knew the next day activity would explode around the plane, so we started placing remote cameras. The most important was the 24-hour time lapse camera. It required us to be on site the entire time but we have done many and will do many more. With the elevated stand placed at the nose of #43-48950, the tripod was attached to the stand and the time lapse started just before sunset. 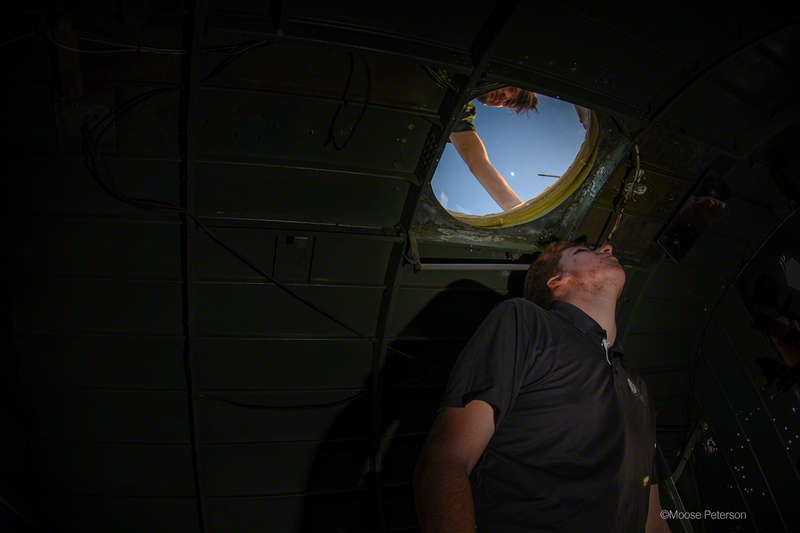 In addition, time lapse cameras were placed inside the fuselage to capture all daylight hour work inside the fuselage. In total, five remote cameras would be capturing the next day’s work with two bodies as floats picking up very specific tasks being performed. Tomorrow will be a big day! The plan was simple, fly over to Keystone, participate in the pancake breakfast, Ed would speak then by 10:00 we’d be in the air flying 43-48950 on its ferry flight direct back to Tampa Executive Airport. 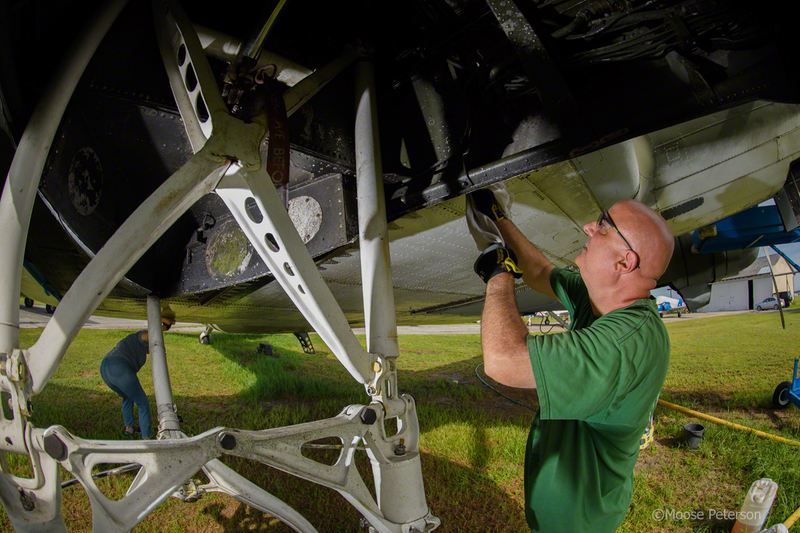 Everything was done, paperwork, fueling, repairs, inspection, she was ready to make her flight and into full restoration. So, when we landed at Keystone at 08:00 we were excited as we got to work. 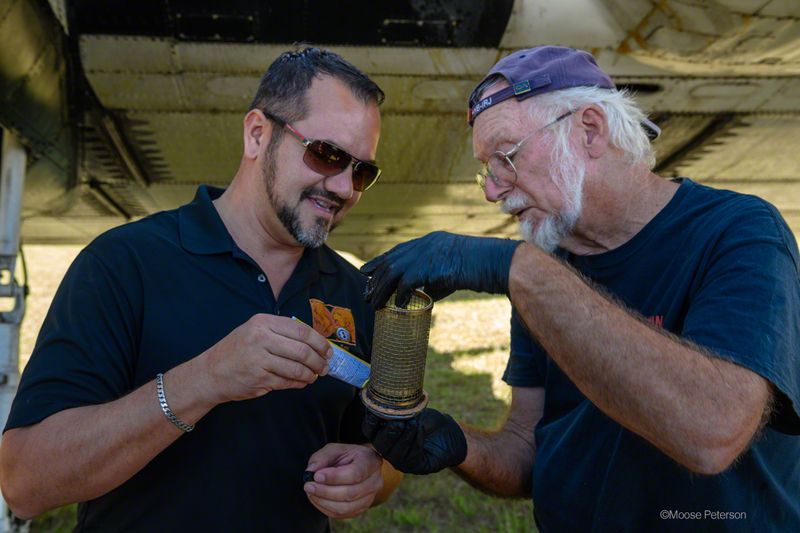 Brent & I had been to 43-48950 a week prior and planned out all the remote camera locations. With all that prepositioning done, we just had to mount that cameras, connect the cables and we’d be ready to film. While that was being done, last minutes checks were being done by the ferrying pilots. 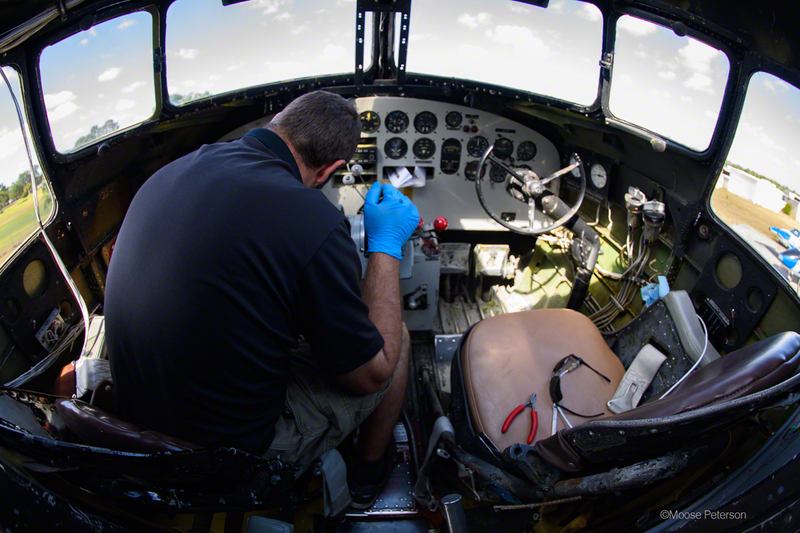 Specialists in the DC-3 and ferrying, they were pros as they went through their own checklists, poking and probing the plane. 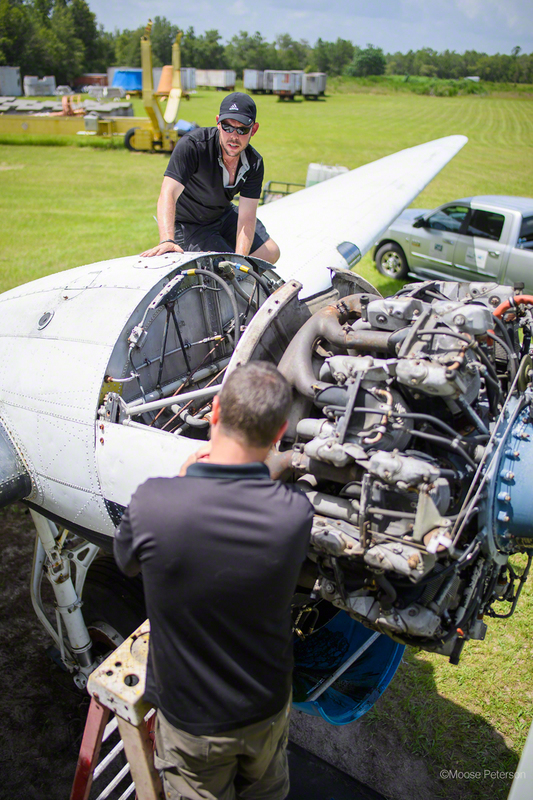 At 10:00 they made their first engine check. 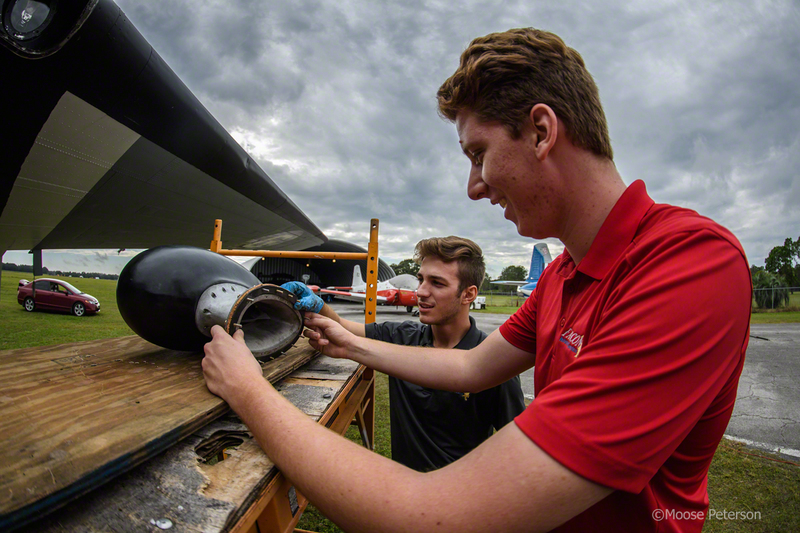 When the systems came to life, a small, flow of fuel was seen coming from under the fuselage. The panel was pulled off and the leak was checked. At first the drip was enough to slow things down but not enough to call off the flight. As they dug into it more and more, it was obvious the ferry flight might be called off. Within a heartbeat, the filter was off and the cause of the leak being tracked down. I lost count how many times the filter which seemed to be the cause of the leak, was pulled off and worked on. 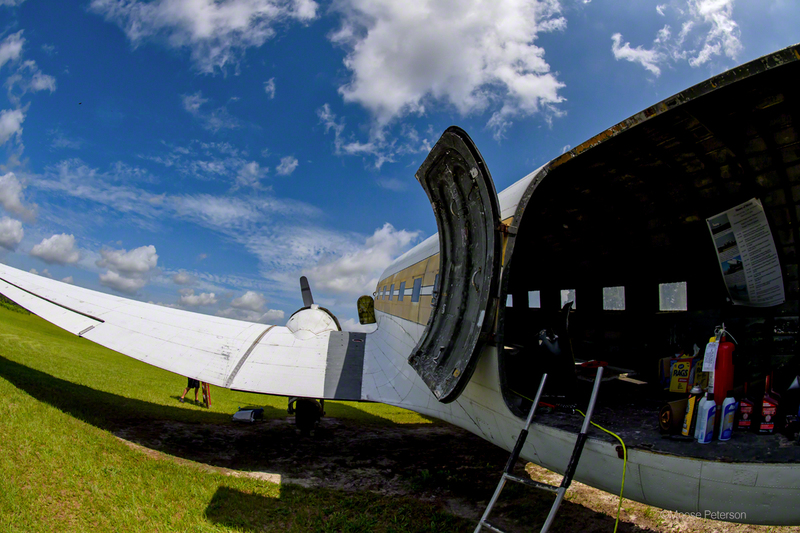 It was Sunday and there just isn’t a DC-3 parts store around the corner in the middle of Florida. The hours went by as field repair after field repair was attempted but failed to fix the slow, drippy leak. It was 12:30 when a run was made to a distant auto parts store to see if they could find a gasket that would work. The clock was ticking, sunset not far off. The car came back with three different options. In the meantime, the filter housing and connector were given great TLC, cleaned to brilliance like from the factory. All connecting lines were rechecked to make sure they had the actual leak in hand. With great care, they were tried the best gasket, pressurized the system and the leak was gone. With that, they turned over the engine as a final test. It was dry! At 15:30 43-48950 was in the air on its way to Tampa Executive. Almost two hours later, 43-48950 smoothly landed at Tampa Exec! The flight went without a hitch, just slow. 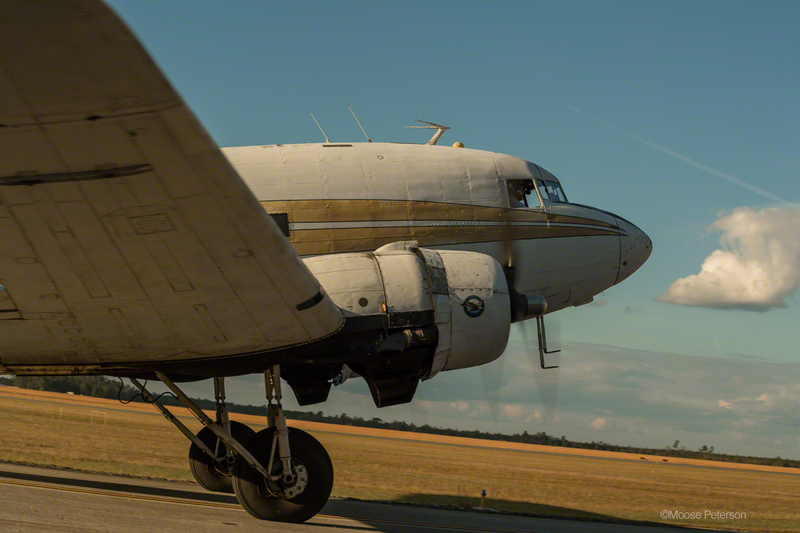 Other than the typical warbird issue of bad radios, no new squawks appeared and there were no scary moments. 2017 closed with the first big hurdle in the rear view mirror with the real work beginning in 2018 getting ready for the flight in June, 2019! 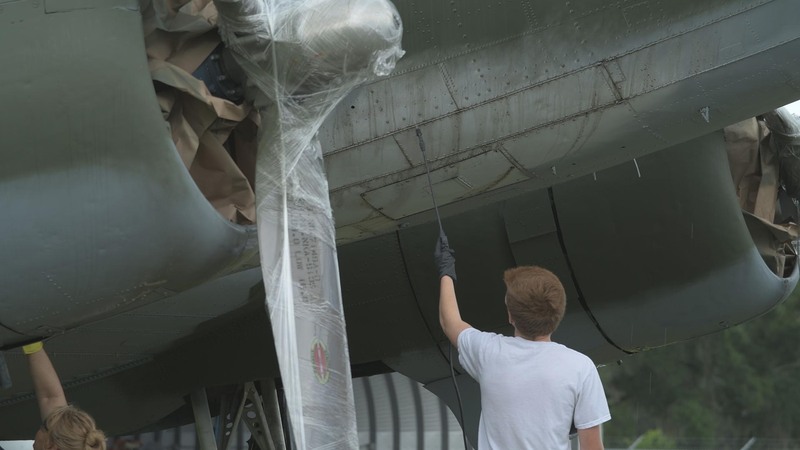 If you’ve never been involved with an aircraft restoration, it’s hard to conceive of all the time that passes by with what appears little progress. Progress at times can be measured by one screw or rivet at a time. At the same time, other factors of life come into play that seem to bring progress to a halt. This what’s been happening over the last couple of months with 43-48950. It was determined the carburetors needed to be rebuilt and that required them being shipped to a specialist. A week prior to Hurricane Harvey hitting Houston, the carbs arrived in Houston for rebuilt. As you might imagine, that slowed their progress a bit. And just weeks later, Hurricane Irma made a direct hit on Florida and while it turned 43-48950 sister ship into a pretzel, 43-48950 sustained no damage from the hurricane. Dodged a huge bullet there! At the same time, parts that on inspection were determined to need replacing were searched for, acquired and slowly installed. 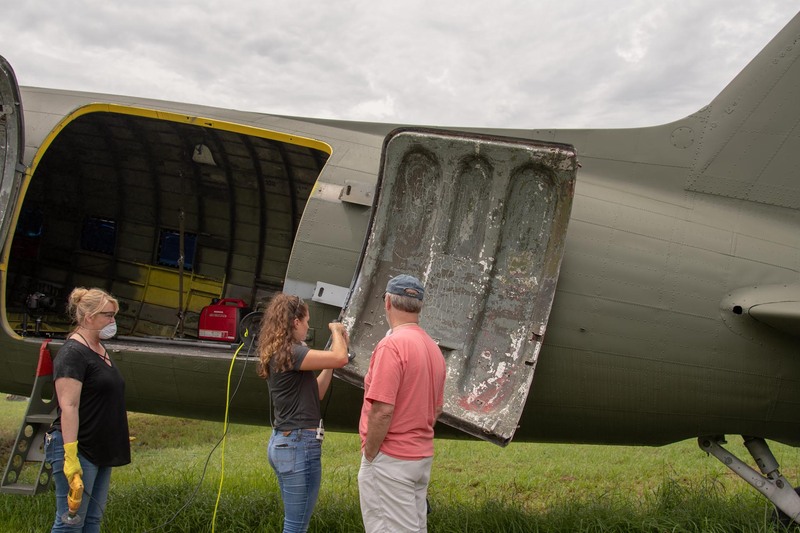 A plane that was built in 1943 can be a challenge in finding parts. And restoring it like it came from the factory further complicates things. While it seems like a little thing, but the location and acquisition of an authentic ladder for 43-48950 was a big deal (it was missing)! 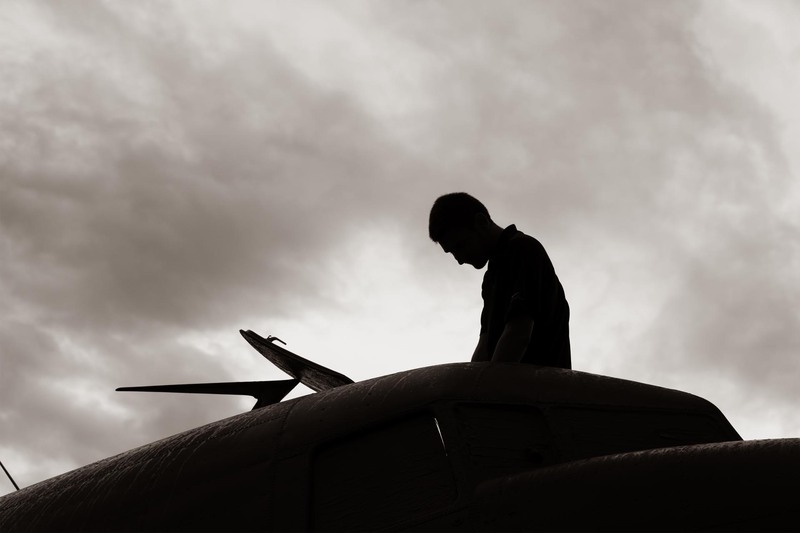 There is nothing that goes quickly especially when meticulous attention is given to an entire aircraft. So, when we flew over to 43-48950 on 20 November, it was because that next big phase was scheduled to occur. 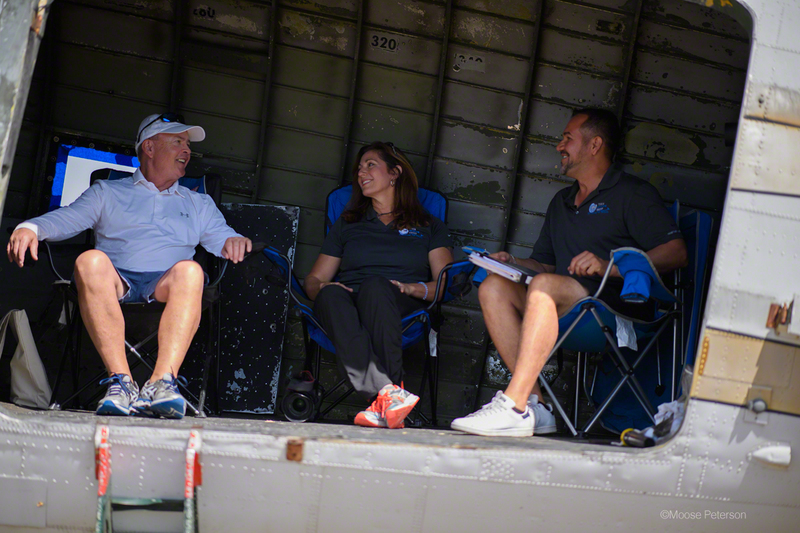 The “boss” flew over with us today which is always fun. In fact, even though the temps are hot, humidity is cranking, the one thing this project is it’s always fun! We land and instantly go to work and the work went really well. Lots of items on the check list were checked off as completed. In fact, it went so well the call was made to turn the engines over and make a taxi run to check engines and brakes. 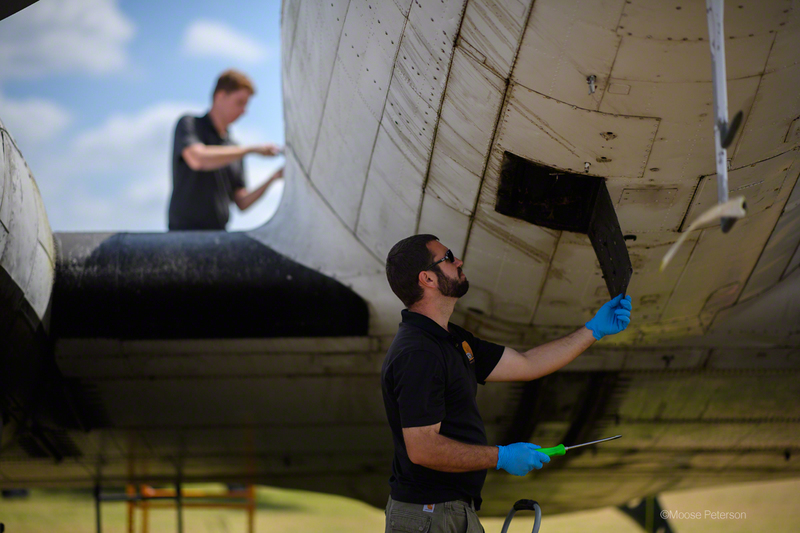 As always, while camera was in hand, getting our hands dirty is just part of the whole experience. 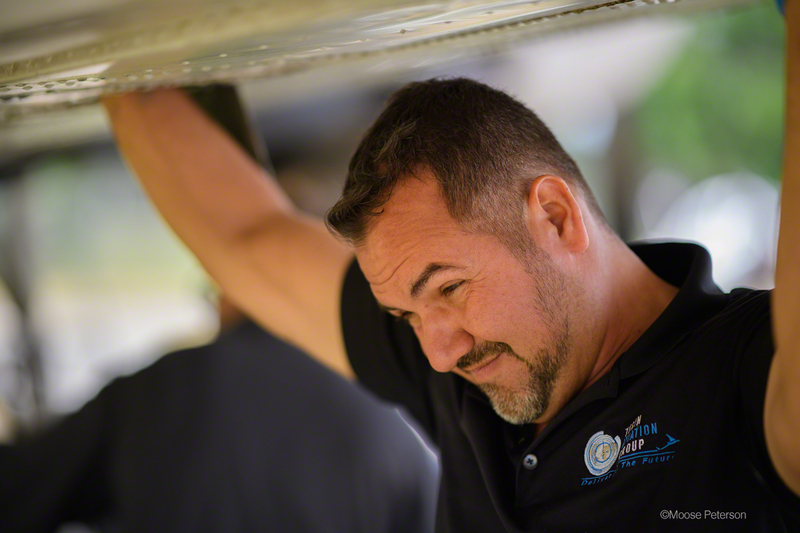 Ed, “The Boss” wanted to make another inspection on cables and fitting inside the wing. It can be really hard to get head, hand and light into those inspection panels to look around. Brent turned the Osmo video camera into a very effective inspection tool for Ed. He could not only see what he wanted to see but take photos of parts for later work. 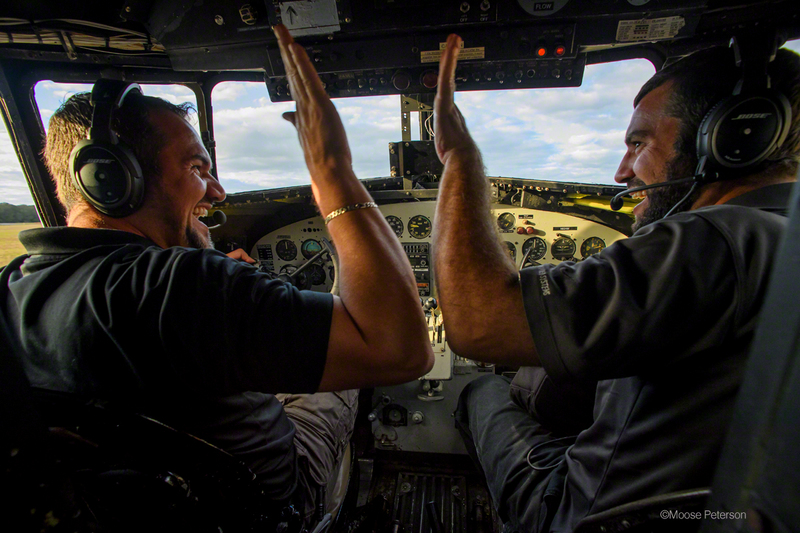 After a briefing in the radio compartment, Ed (left seat) and Jonathan (right seat) got the checklist in hand and went over the procedure to turn over the engines. With that, they went through it all again but this time actually flipping the switches and turning over the fans. The engines roared to life the first time and for minutes turned as they warmed as Ed and Jonathan looked over all the gauges and numbers. When it all looked good, Ed took his foot off the pedal. 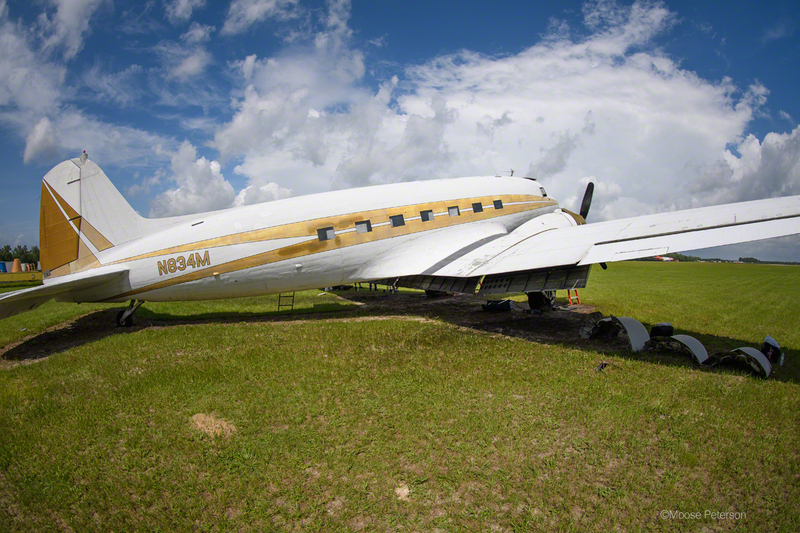 The tail lifted off the ground and 43-48950 rolled forward off the grass that’s been its home for so long. It rolled to the tarmac, made a right-hand turn and rolled down the taxi way. You could tell the tires had not rolled for some time as there was a bit of a flat spot. That was gone quickly though. With a successful role down the taxi way, 43-48950 turned around and went through a series of brake test, all successfully. 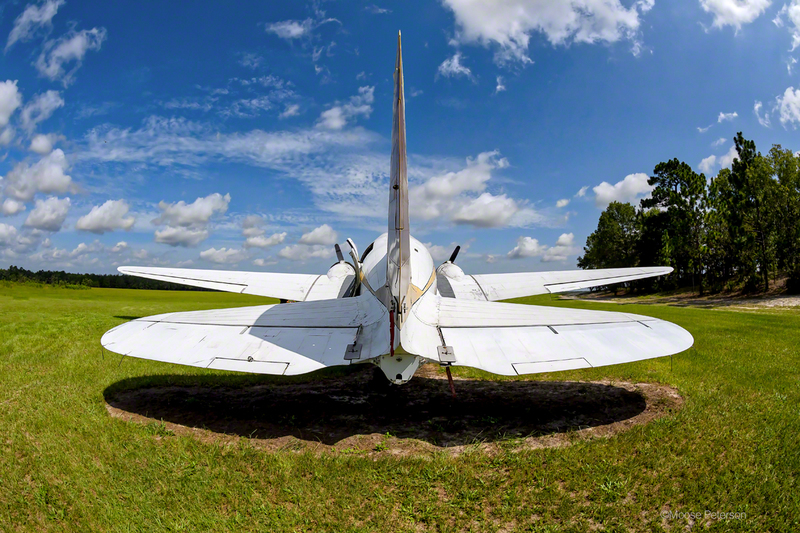 She rolled back down to the grass, turned and was parked in her new, temporary pad waiting for the next big moment, ferry flight back to Tampa Executive. It was starting to become a routine. 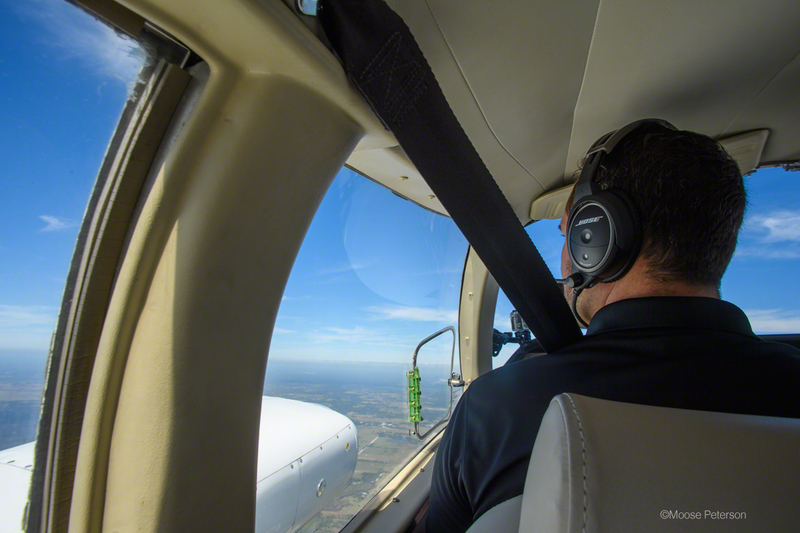 We showed up at Turin Aviation and loaded up our gear in the Cessna 310 for the hour flight up to 43-48950. We couldn’t wait to get up in the air where we could get cool only to heat up again as we land at Keystone. The days goals were to finish up the inspection on the power plants from the day before and put into action what those inspections found. One of the challenges of working on 43-48950 at its remote location is that tools and materials have to be hauled in. That includes even electricity! 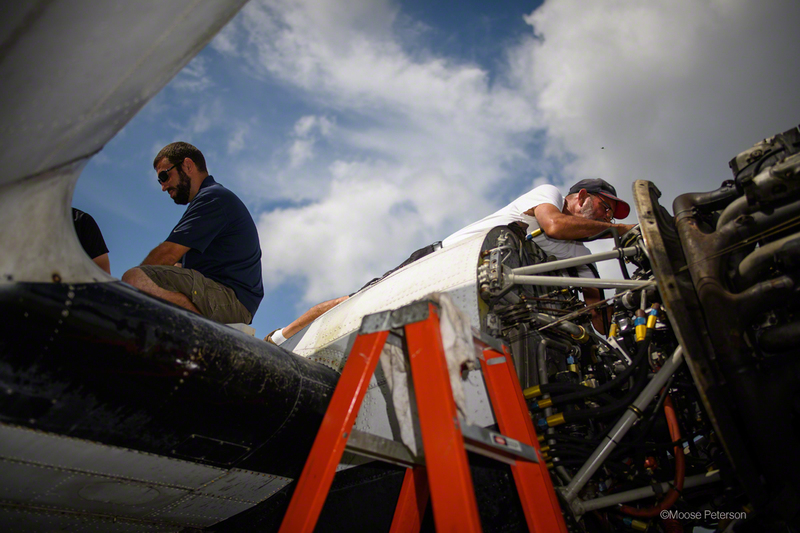 So, this trip the Cessna is loaded with a generator, tools, lubricants, towels, water, camera gear and 6 workers. Getting everything into the Cessna required careful packing not just because not just of space but weight. 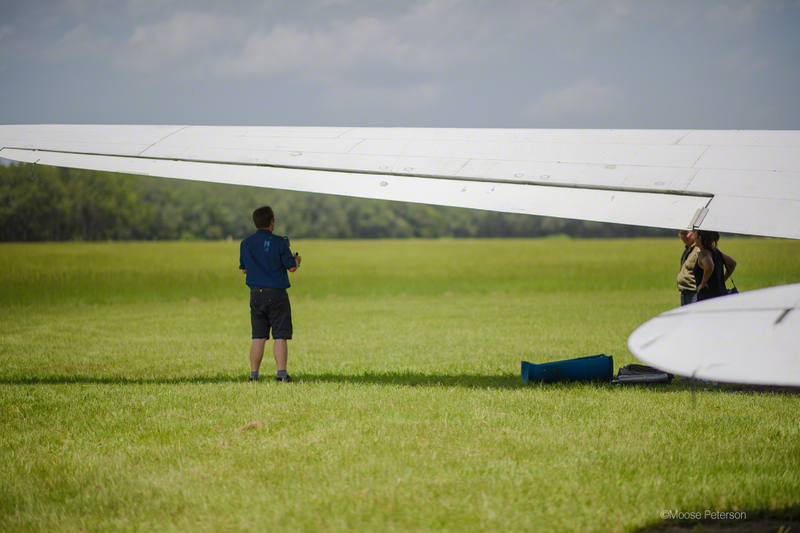 Distribution of the weight is an important aspect of flying, simple CG. I’m here writing so we must have gotten it all right. While it might seem hard to believe but fuel lines and tanks are checked for these little devils. Great care is to check for this and other issues with the fuel. Another culprit causing problems is water. 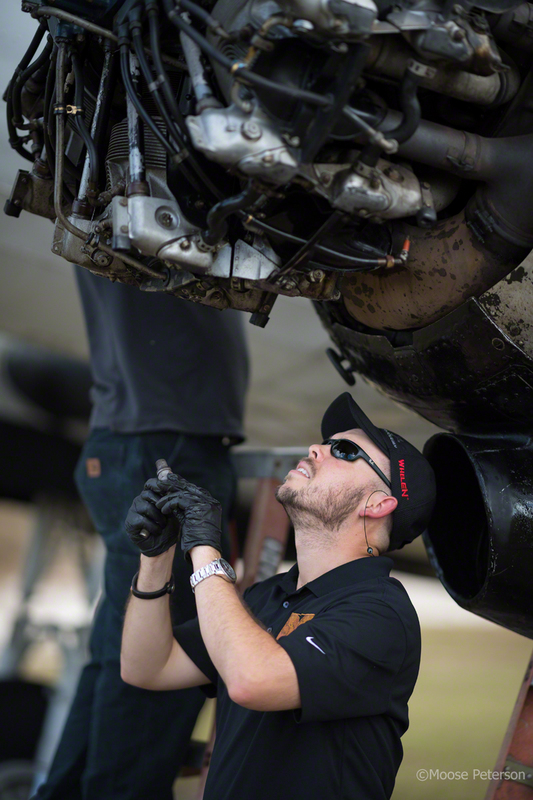 Water in the fuel system is part of every aircraft’s preflight, it’s that important. 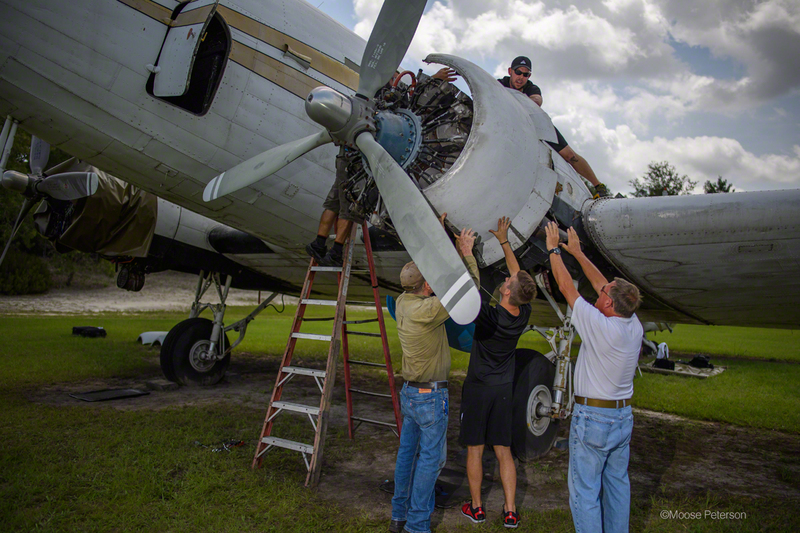 Imagine the need in an aircraft that has sat out in the Florida environment for decades?! With great diligence, it was all scrutinized. On the ground, the work quickly begins back on those R-1830s. They soon got down to the carburetors. They were scrutinized carefully and left in place for the moment. One of the dangerous scenarios they are on the guard for comes from a bug, what they normally call a mud dobber. 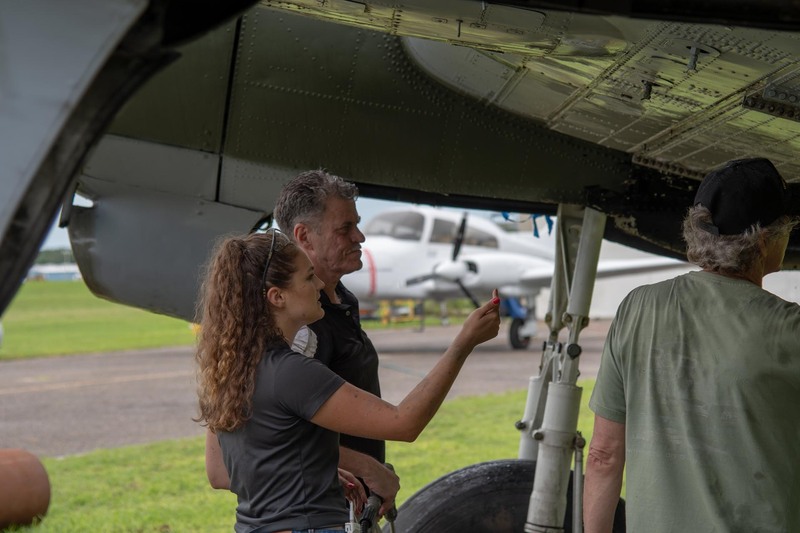 The Paper Wasp like to crawl into very small spaces which aircraft engines provide lots of making the perfect home for a nest. Those nests quickly fall apart with an operating engine and that material can instantly plug a vital supply line causing major problems. This process took the better part of the morning and bleed into the afternoon. It was then decided that an engine test was ready to occur. The inspection found that basically was in good condition. The one unknown was would the engines even turn over let alone run. The batteries were dead so moving past that obstacle, the right and then the left right turned over and ran. That was a great feeling, literally, as those R-1830s came to life vibrating the air as the props turned. It was determined from the run ups that items like oil pressure looked really great. But the fuel was having an issue reaching the cylinders. With some more inspection and testing, it was decided to pull off the carburetors and get them rebuilt which was done. They arrived at a shop in Houston a week before Hurricane Harvey hit. It would be a while before they made it back. While Brent & I were getting to know 43-48950, the Turin Team was busy at work in the blistering Florida sun on the its power plants. 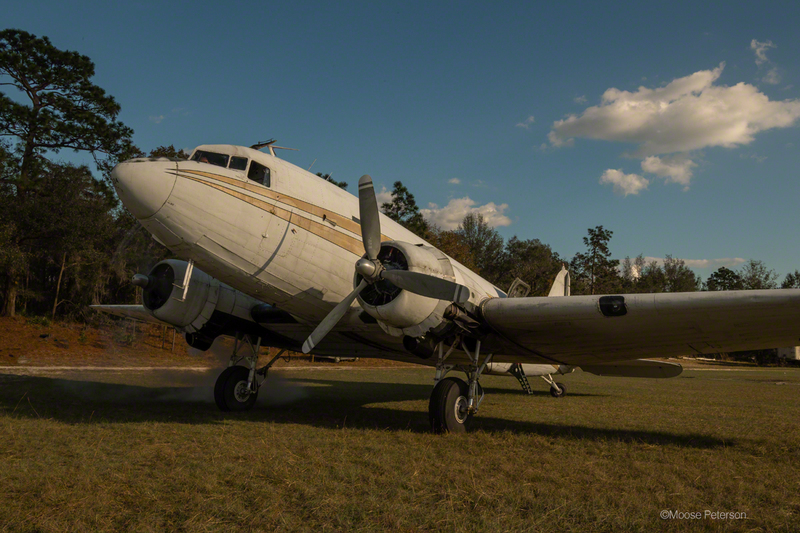 One of the big assets of the DC-3 is its two Pratt & Whitney R-1830 Twin Wasp 14-cylinder radial engines (that produce 1200 hp each, providing thrust enough to lift 20-plus passengers and baggage or a 6,000-plus pound cargo load cruising at 160 to 180 mph). Fortunately, 43-48950 engines stopped with only 240 hours on them. In other words, they haven’t really even broken in yet, still on the new side of life! 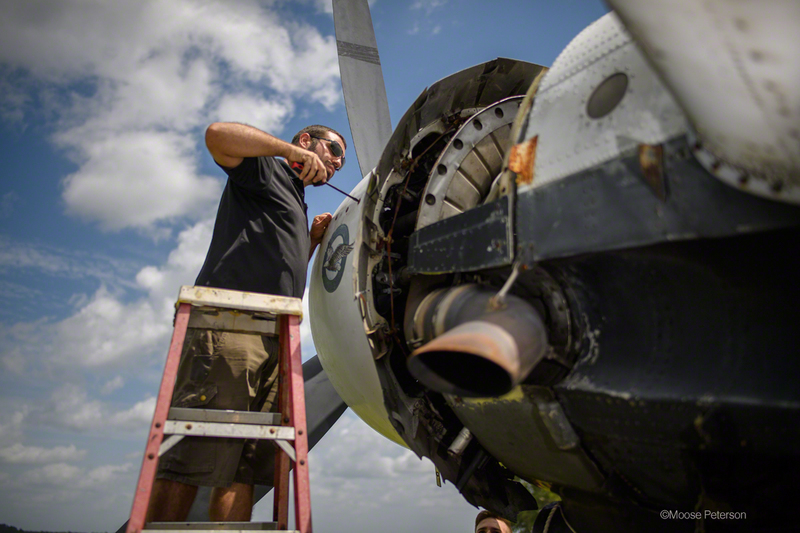 The team started with the simple task of removing the cowlings. I say simple because we weren’t on the ladder working in the sun fighting years of age to loosen the Camlocs that might not have turned for a decade. 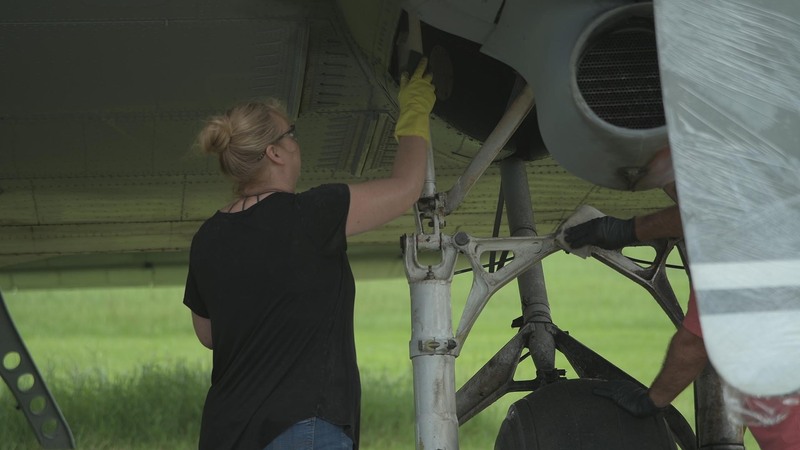 With the help of the crew and many bottles of cold water, the cowlings on both R-1830s were off and inspection of the engines could begin. The inspection was more than just a visual one. 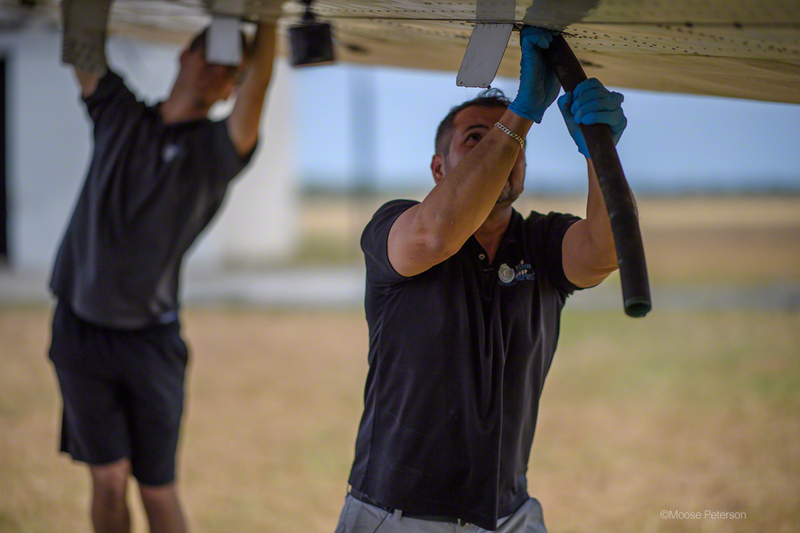 The Turin Team are all highly experienced mechanics who thoroughly and methodically dig down part by part into the engines. 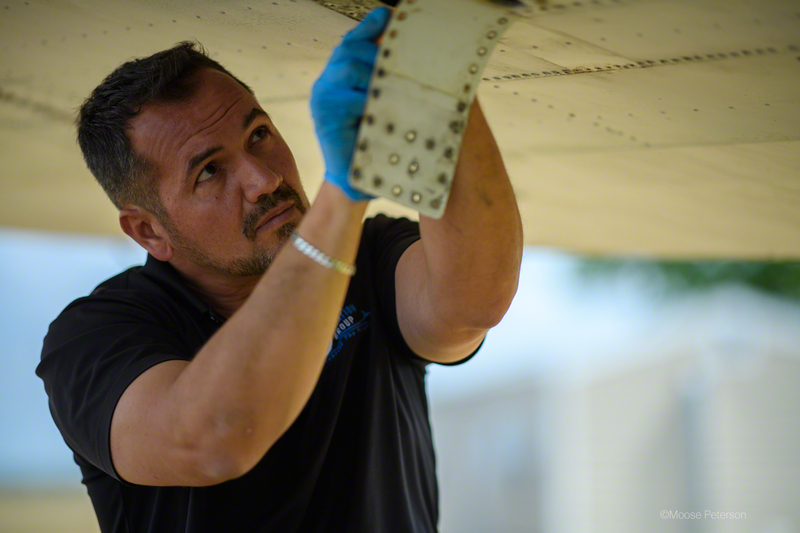 There is the obvious reason of inspection for operational and safety, but in a restoration with the goal of flying to France and back, time and budget is just as much a part of the inspection process. The short-term list is the safe ferry flight getting 43-48950 back to Turin Aviation, the long term is that Atlantic flight. 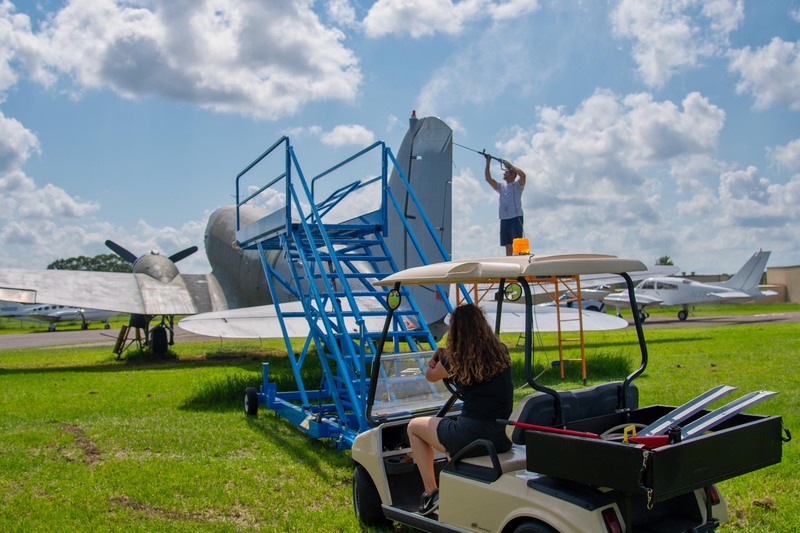 Some were on ladders at the nacelles wrenching (a simple aviation terms that encompasses every sort of mechanical work on an aircraft) on the R-1830s, others were doing what might seem the mundane, spraying the cowlings getting years of dust, sand, bugs and swamp cleaned off just so an inspection can be made. 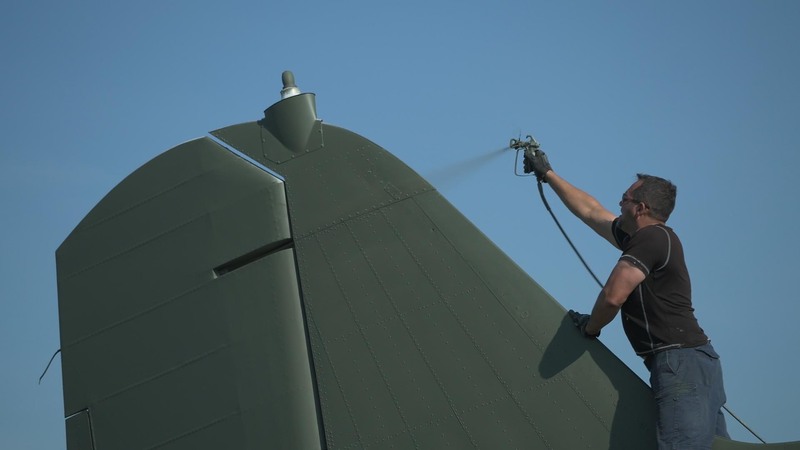 And while the mundane job might seem like a great way to beat the heat, that’s an environmentally safe degreaser that really stings the eye! That spray is not a way to beat the heat, you stay out of its way! 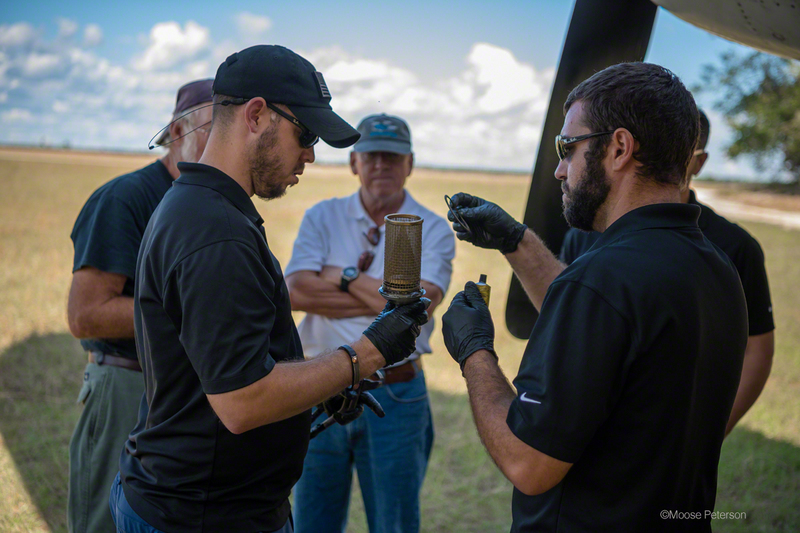 Though Brent and I are there to document all the work being put into 43-48950, we can’t help but get our hands into the work. 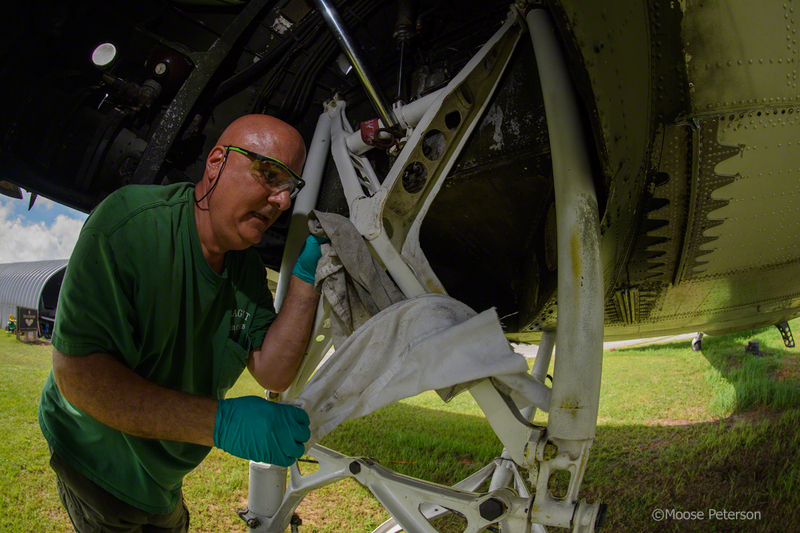 For that reason, we carry wipes in our pockets to clean the grease and oil off so we can get right back to shooting when we’re not hands on working on 43-48950. It might be just our first day, but we have already fallen in love with the old lady, 43-48950 and can’t wait for tomorrow. 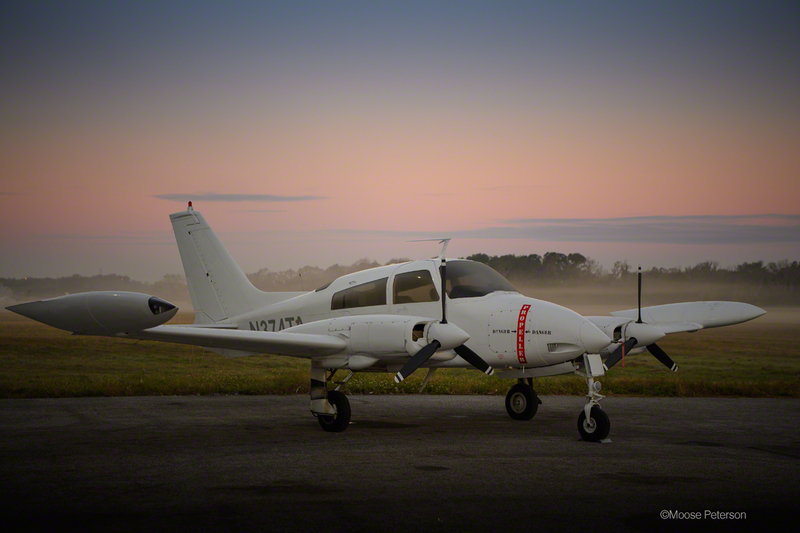 As the sun falls behind the trees, we wrap up the day’s project, jump back into the Cessna and head back to Tampa Executive. And back in the coolness of our room, we were hot to trot as the excitement of the day, the project and of the progress kept us up all night! The inland Florida July weather is stifling! With temps hovering above 100 with humidity to match, we started the tour of 43-48950. 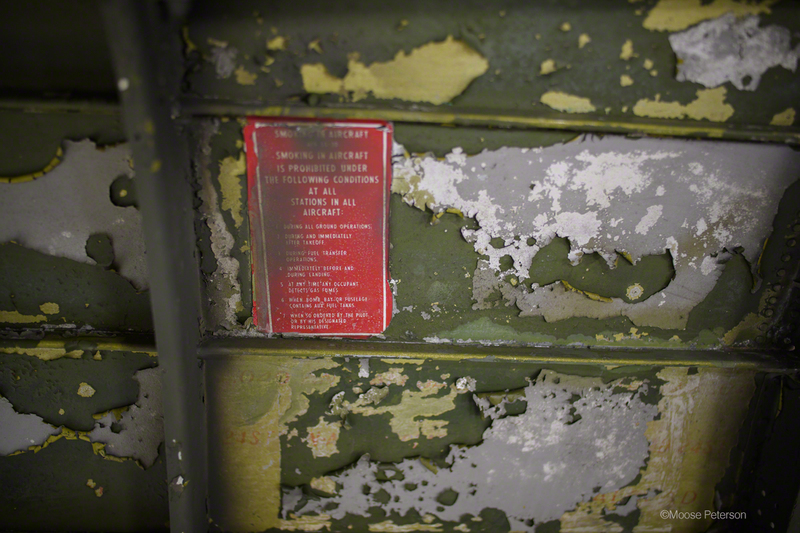 The mosquito district painted the exterior as you can see in the photographs. The interior though, they did not paint per say. 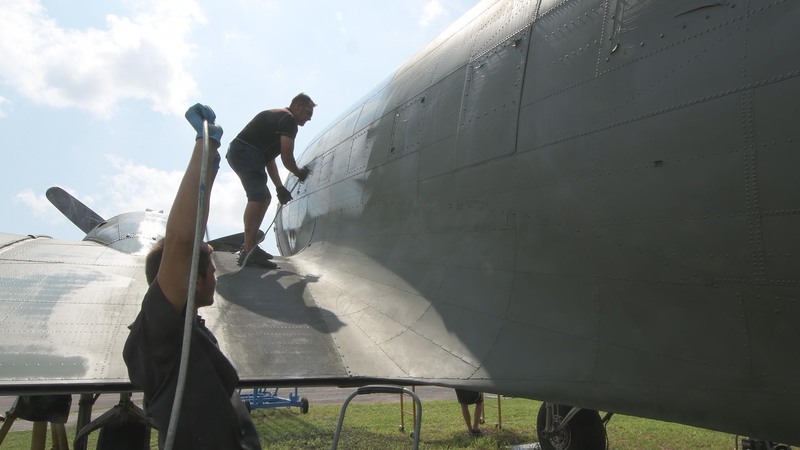 They installed their spraying equipment on top of the “C-47” WWII configuration from Europe and in doing so, preserved it! 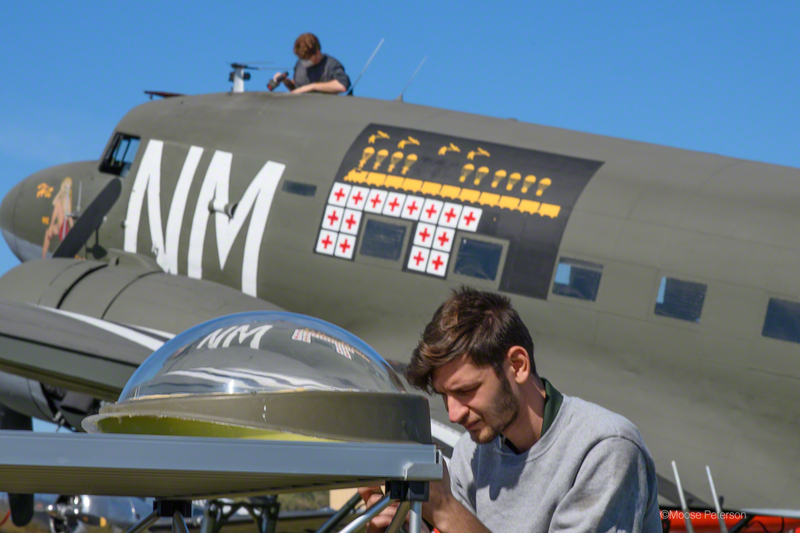 The missions 43-48950 flew as a transport, paratroopers and wounded, whether by design or good fortune, saved for future generations. Through the sweat pouring from us we, started to examine the history before our eyes. The anchor points for the paratroopers are still there in place, exactly where they were in WWII, that those boys hooked up to prior to making their jumps, such as in Operation Market Garden. You can still see where the cable vibrated and rubbed the paint off those anchor points, from when the rip cord was connected to the cable. It’s a steep incline as you walk up toward the cockpit. 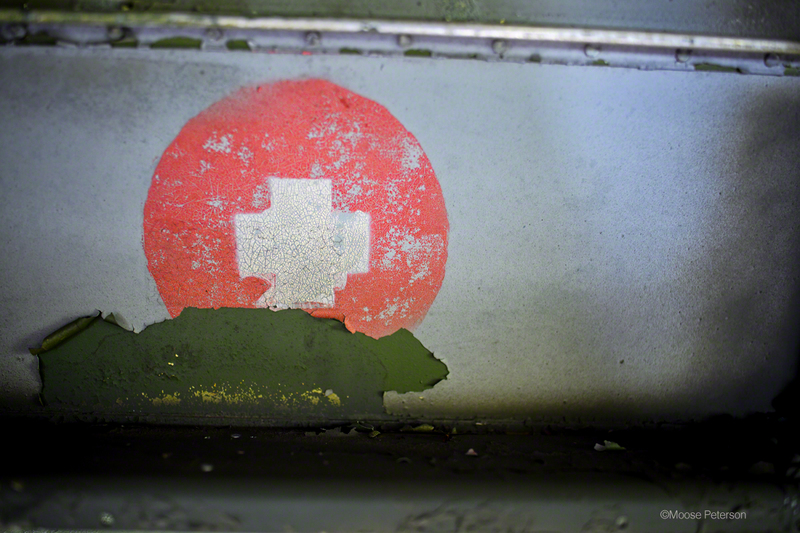 Nearer the front in the main cabin but close to the radio station you start seeing the Red Crosses, painted on at the factory back in 1943. Then you see the messages for the stretcher stations, places where wounded young men were placed for flights back to safety. The sad and haunting thing is we know now all those young men made it back to safety, alive, thanks to the gallant effort. 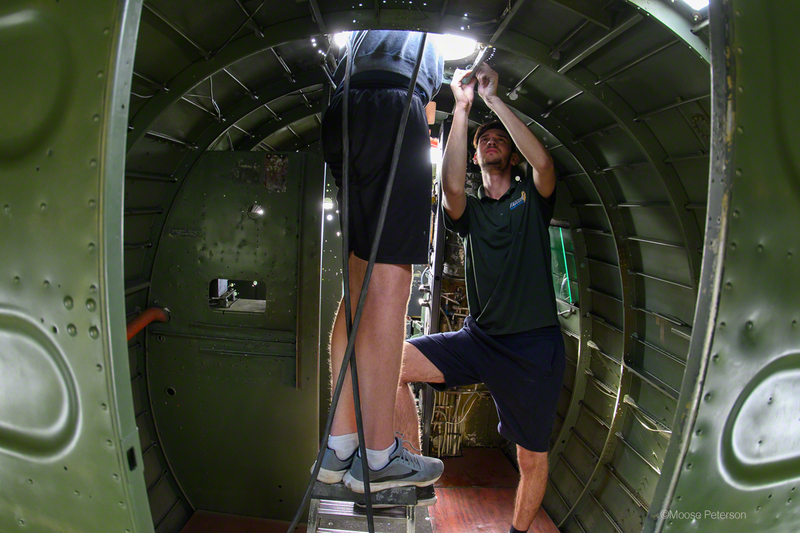 Inside the fuselage, Florida’s constant reminder it was summer soaked our shirts with sweat as we moved up into the radio station. 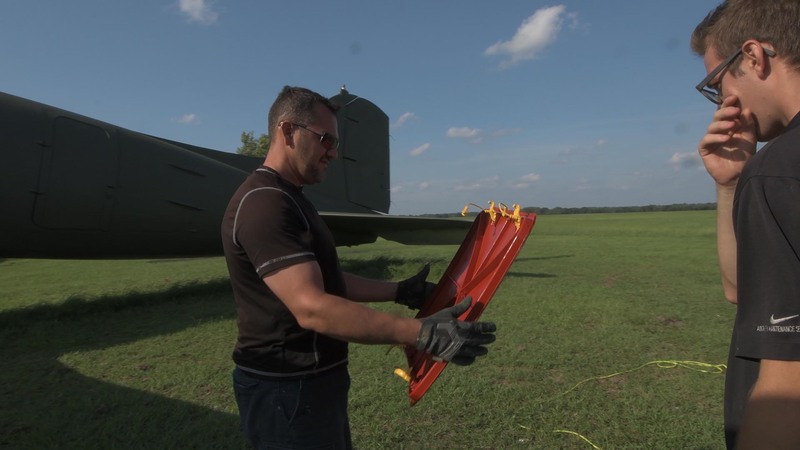 The mosquito district removed all the radio equipment and table, a weight saving measure. That will be restored back to its original factory equipment with some of that equipment already acquired. 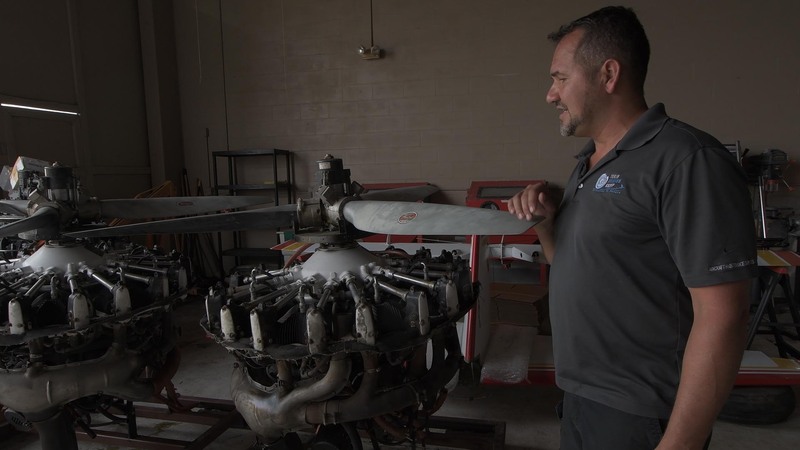 That is one of the challenges of 43-48950, determining all that this individual aircraft had and then finding the original parts, which in some case, can’t be found. We are here to document it all, but it was very hard to when faced with all this history staring you in the face. The start of the new project, one the word excitement doesn’t begin to cover! 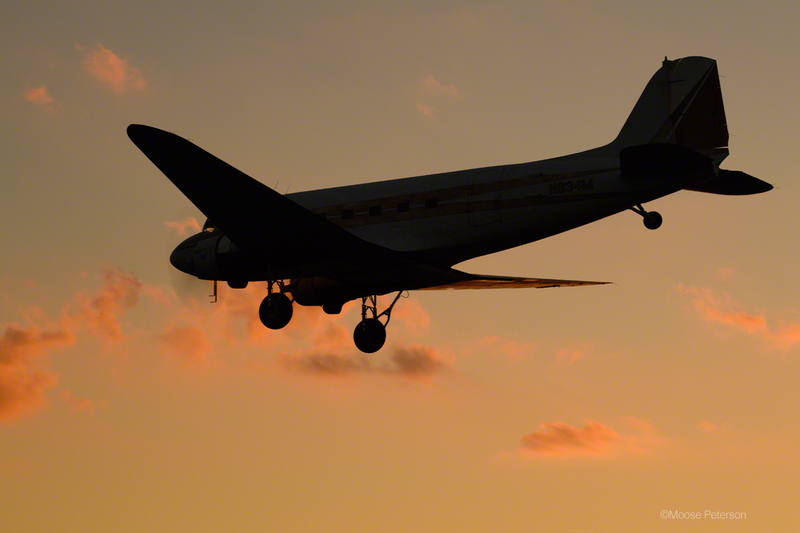 We arrived at Tampa Executive Airport, Turin Aviation to brief the short and very long-term goal of the documentary. 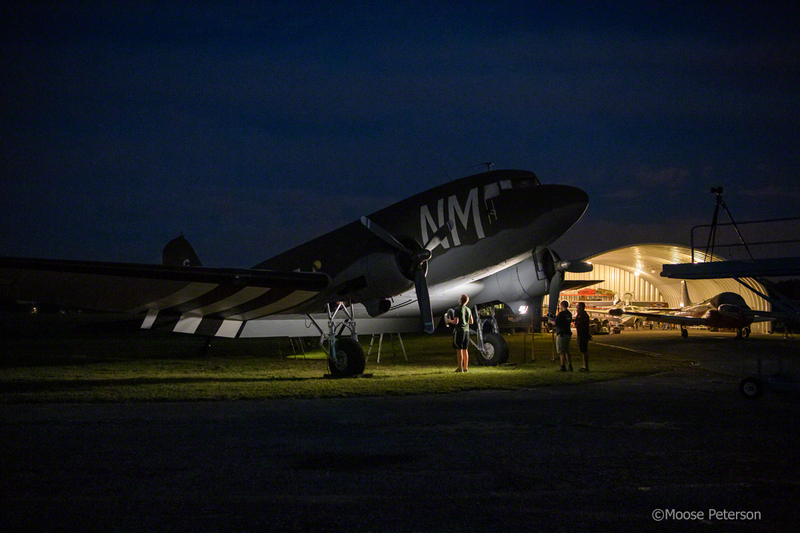 In a nutshell, a WWII vet, a C-47 came back from the war like so may vets and went into civilian service. 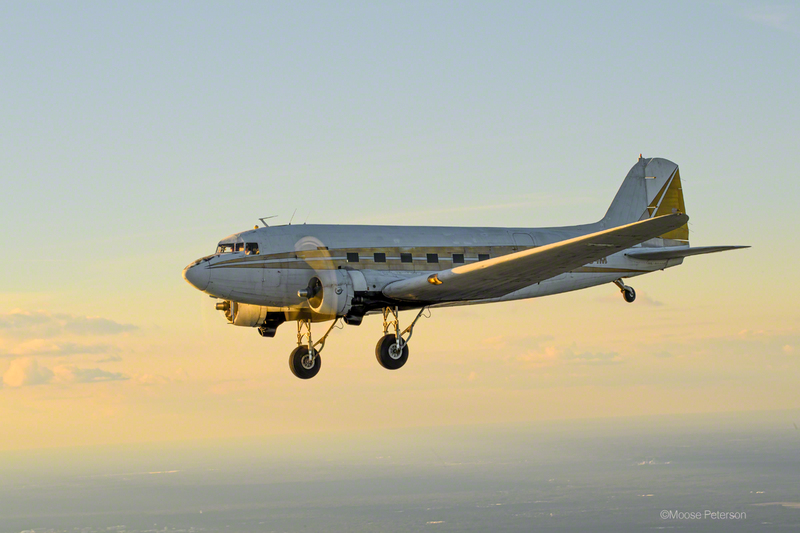 The goal of the project is to bring the now DC-3 back to its factory C-47 configuration and fly it to France in 2019. With that, we jump into our ride to the DC-3 located at Keystone Airpark in Turin Aviation Cessna 310Q (what will become the norm for the next 6 months). 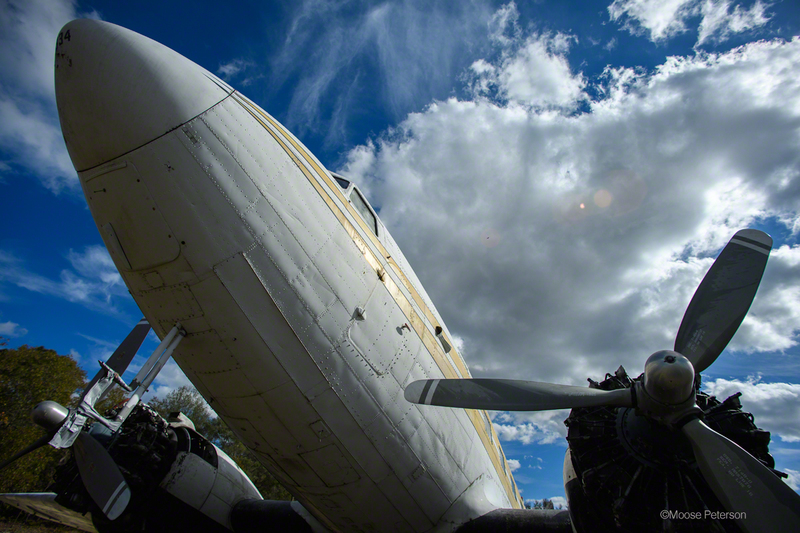 Keystone Airpark is a former WWII training base for fighter pilots, primarily the P-47 Thunderbolt. 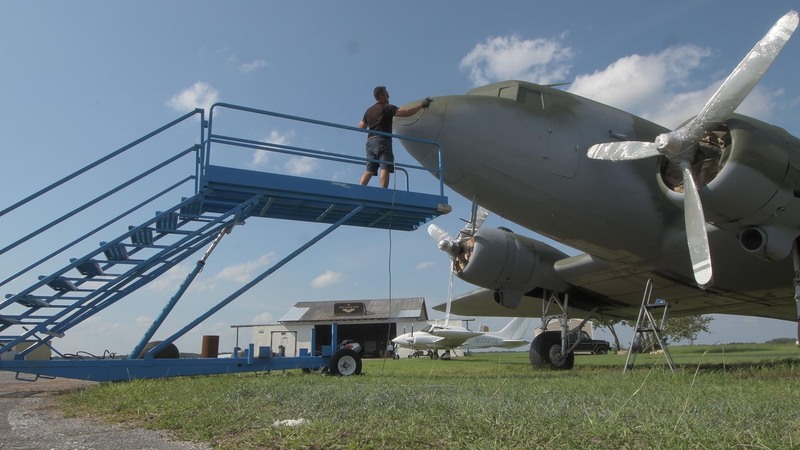 It’s the home of Wing of Dreams Museum, the current caretaker for N834M / C47B 43-48950 (that won’t change until N834M touches down at Tampa Exec). 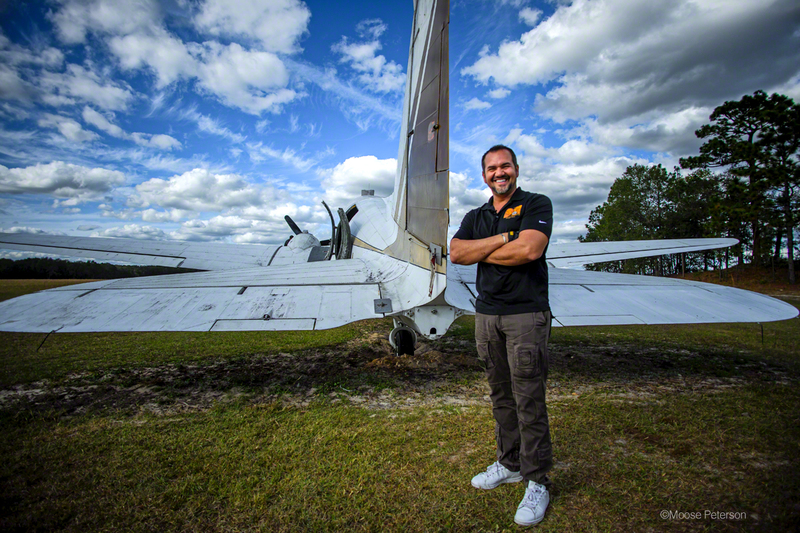 On the edge of the tangle of Florida swap forest, sunk in the sands of time surrounded by fire ants is where N834M has been for the past five years. It’s from here the team goes to work to bring N834M back to life for its ferry flight and its return in the restoration shop to 43-48950.